13.4 Assesable Building Works - Residential Outbuilding Exceeding 120m2 in the Rural Zone (448.65m2) (File: 2013/18788). Attendees: Cr. Cameron O’Neil, Kevin Chambers, Jacki Erickson, Ian Galloway, Gabrielle Barron, Linette Chandler, Jim Scott, Gary Schefe, Kym Downey & Kelly Rogers. That apologies be received for Cr. Peter Flynn, Katrina Marsh, Sarah Holt, Justin Garvie & Robert Nugent for the meeting. 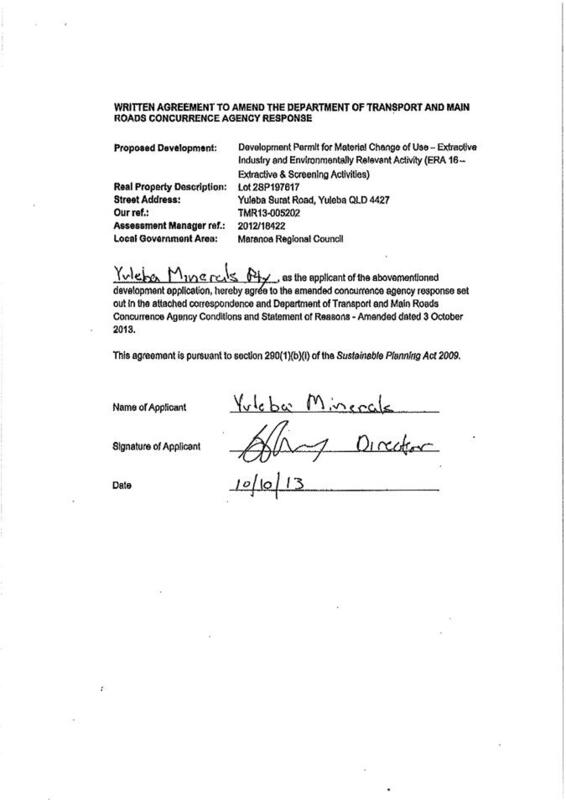 That the Roma CBD Advisory Committee Meeting Minutes of 17 September 2013 be confirmed. This was officially recorded as the final meeting of the Roma CBD Advisory Committee. That a report be collated for presentation to Council at an upcoming workshop, followed by formal endorsement of Council as specified as part of the minutes of the meeting. The Chair welcomed Deputy Mayor - Cr. Scott Wason, and Graham Osborne representing The Western Star to the meeting. Ian Galloway presented members a range of photographs depicting monuments, sculptures and streetscapes of locations he had observed whilst travelling. A selection of these images will be presented as part of the committee recommendation report to Council for inspiration and representation of visual examples of what could be achieved in the Roma CBD. Ian also presented members with a stylized image of a bottle tree. This example could be used to construct a metal sculptural bottle tree for placement in a variety of locations in the Roma CBD. These images will also be presented to Council as part of the committee recommendation report to Council. The Chair verbally read out the letter of resignation received from member Tyson Golder, and provided attending members a copy of same. That the letter of resignation from Tyson Golder be received and noted as tabled. Expand the installation of bottle tree & other sculptures beyond McDowall Street i.e. the entire Roma CBD. 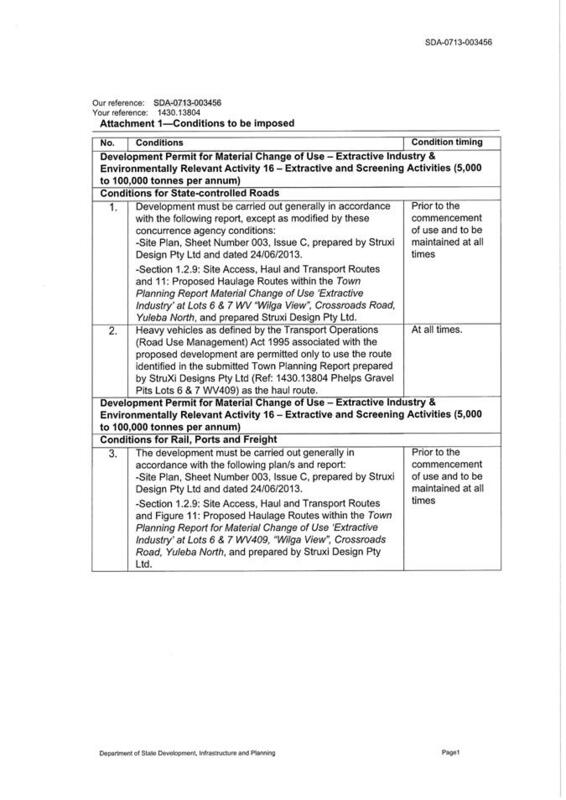 Expand description to include an audit taxi bay use in the CBD (with a view to potentially reducing the number of designated taxi bays in Wyndham Street). Specify service and tourism signage for location on both Quintin & Bowen Streets. Include the designation of disabled parking outside the Chemist on McDowall Street. That the table of committee recommendations presented, including amendments specified above, be endorsed. The Chair advised members that the meeting was the final meeting for the committee, having met their commitment ahead of schedule. Items agreed for collation in a report to Council will first be presented at a workshop, followed by formal endorsement at an upcoming General Meeting of Council. The Chair formally thanked members for their commitment to representing their community, both as business owners and as shoppers. He further indicated that the formation and work of the committee had been a very successful process in planning for redevelopment of the Roma CBD. Whilst it was not known if all recommendations will be progressed by Council, the consideration of them would be determined through a democratic process. The Chair also advised members that he would be proposing to Council, supported by the Deputy Mayor, that a ‘Town Improvement’ committee be formed in Roma. Should this committee be progressed, he further invited all members to put forward a nomination to the committee. The Chair also commended members for putting forward their recommendation to implement a 40km speed limit in the Roma CBD, and to introduce regulated parking, both of which were endorsed formally by Council. Terry Hyland welcomed all present and declared the meeting open at 10.05am. The Design Workshop commenced at 10.05am. AEC Group and StruXi Design presented regarding the Master Plan which is currently in week 13. · Is there a demand for reticulated gas on a large scale? The Design Workshop concluded at 11.45am. Meeting minutes from previous meeting 29th July 2013 were confirmed at 11.45am. Moved by Cr Peter Flynn. Second by Terry Hyland. There was no business arising from the previous meeting minutes. · The total sale throughput from 1/07/2013 – 31/08/2013 is 90,661. · The total sale throughput from 1/07/2012 – 31/08/2012 is 68,102. This is an increase of 22,559. · The total sale throughput from 1/01/2013 – 31/08/2013 is 316,935. · The total sale throughput from 1/01/2012 – 31/08/2012 is 224,672. This is an increase of 92, 263. Longreach and Blackall are experiencing issues with no grass and no local suppliers which in turn is resulting in the animals being sent to Roma. There are no WH&S issues. The continual strive for exceptional Animal Welfare is always of importance at the Roma Saleyards. This is an ongoing process of improvement. There were no arising issues. The Contractor report from Gordon Johnson, livestock contractor, will be attained and included in the agenda for the next meeting. Discussion in regards to other avenues of advertising will occur at the next meeting. At this stage, the numbers for organic spelling are rather limited. The next Saleyards Advisory Board meeting will be held on the 31/10/2013 at 1.00pm. Meeting was closed at 12.00pm. Provide feedback to unsuccessful tender applicants on possible improvement to tender applications for future reference. Follow up with QantasLink to advise on carry-on check in counter as short term solution for passenger check-in. 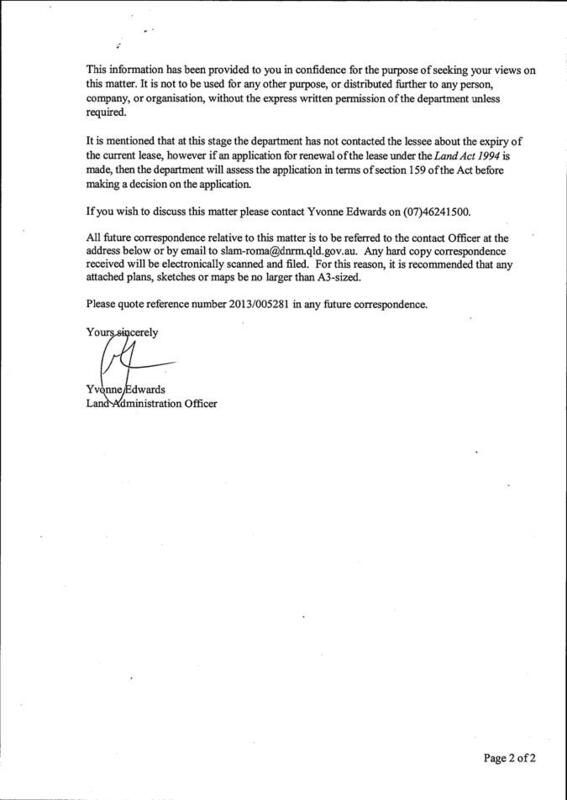 Consult with Telstra regarding reports of poor reception within Roma Airport Terminal. The following apologies were noted at the commencement of the meeting. 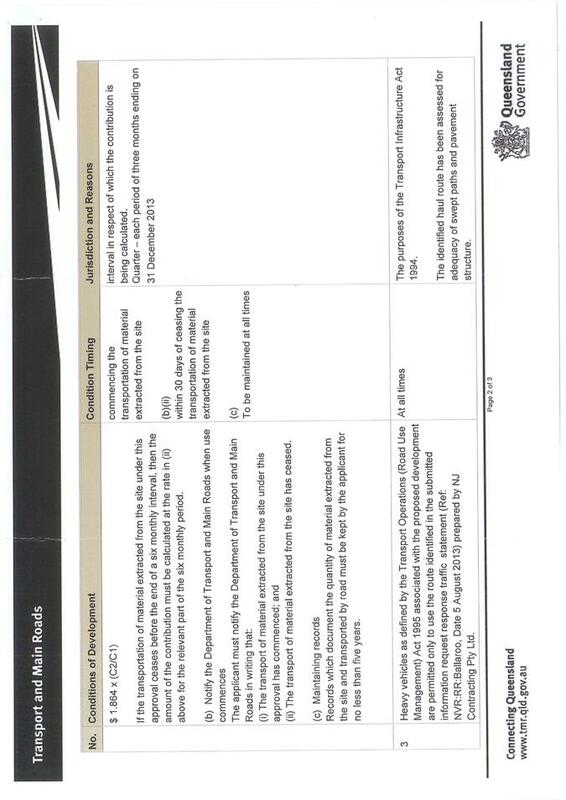 That the Airport Advisory Committee Meeting minutes of 4th September 2013 be confirmed. Lyn Kajewski noted that Council are required to provide feedback to all tender applicants along with feedback on the application for unsuccessful applicants. It was discussed in a previous Airport Advisory Committee meeting that unsuccessful tender applicants should be provide feedback in relation to their application for the Airport kiosk. Ben Jones advised that he is working through all tender applications that were submitted. It is intended that this will be completed and feedback provided within a two week time frame. 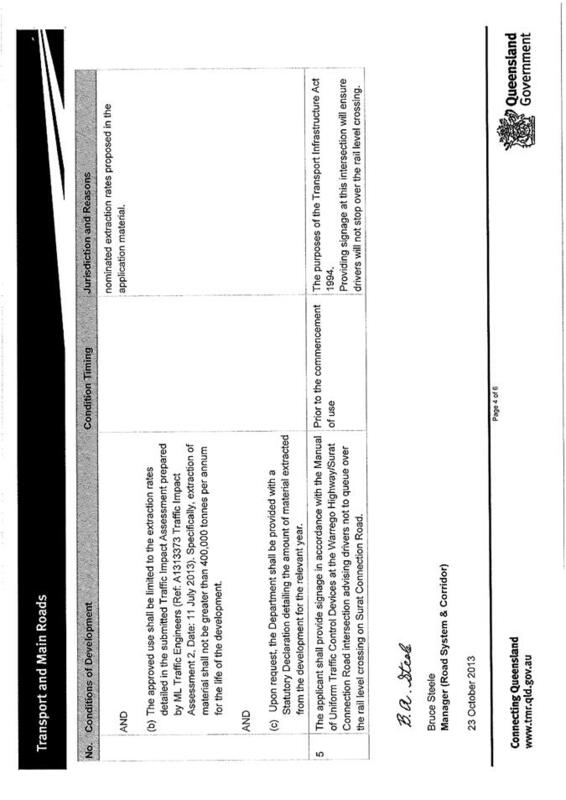 Ben Jones advised that this item has been submitted as an Agenda item for the next Council meeting being held 9th October 2013. 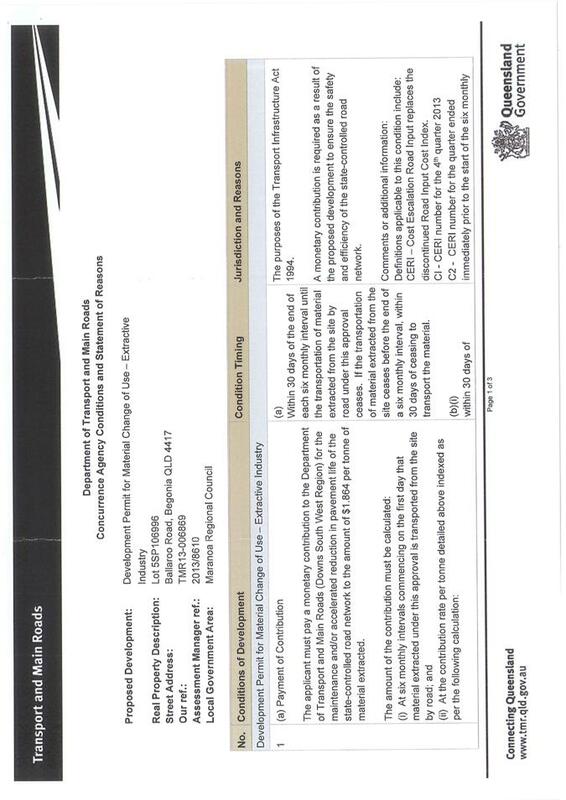 Ben Jones advised that this item has been submitted as an Agenda item for the next Council meeting being held 9th October 2013. Given that the written correspondence will be sent to organisations that have committed funding to the Airport, it is appropriate that Council are aware of and support the correspondence. Ben Jones advised that the new terminal seating arrived and has been installed. To avoid congestion when passengers are arriving or departing, as many seats as possible were installed without closing in any area that passengers normally move through. The committee discussed the need for more seating but no decision was made. Ben Jones advised that the kiosk fit out is on track, with the fit out due to be finished 3rd October. Nektar Remote Hospitality advised that they will be operation the following week. The committee also requested an update on the progress of the third check-in counter. Ben Jones advised that the conveyor unit has been ordered with an advised installation date of mid November. The committee felt that this time frame was too long and discussed short term solutions to the issue. Ben advised that a carry-on luggage only counter can be made operational if QantasLink install a computer at the existing desk. 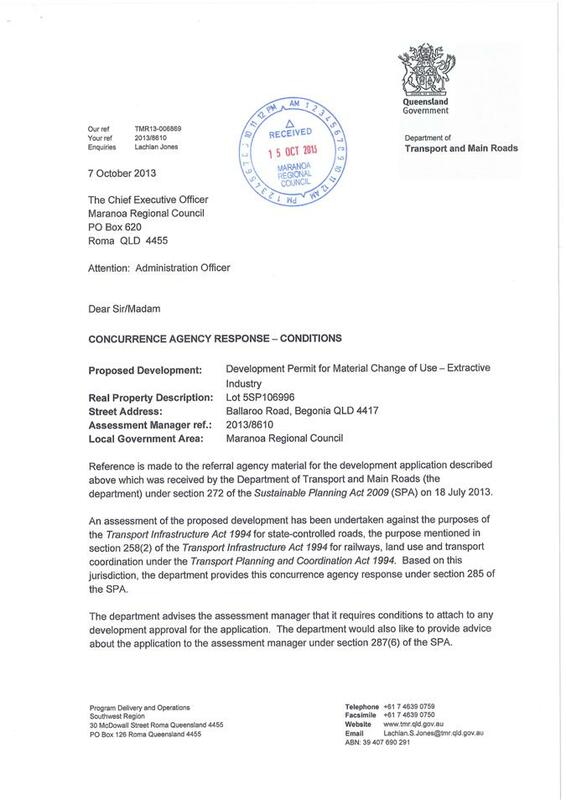 The committee requested Ben follow up with QantasLink regarding this. Ben Jones updated the committee on the recent notification of the Pilot Activated Lighting (PAL) not being able to be activated by an RFDS pilot. At the time of the incident an electrician manually activated the lights. The PAL System was tested the next day with a hand held air band radio, the PAL activated both times it was tested. Ben contacted the electrician to enquire as to what was required to activate the PAL, he was advised it was manually activated as per normal procedure and no fault was found. RFDS have been notified of this. All sites are continually being tested once a week to ensure the PAL system is working. Injune Airport works have been completed and the Airport is now operation to all aircraft 5700kg that receive prior permission. Avdata for Injune Airport has been ordered and is expected to arrive next week. Installation of the unit should follow within 1 to 2 weeks after delivery. The committee discussed the need for Avdata across all sites as a potential revenue stream and allowing Airport staff to monitor traffic. It was noted by Cr. Denton that this topic was something for future consideration; however no decision was required by the committee at this time. Cr. Denton had received a complaint about passengers not being able to take their take-a-way coffee through the screening point. Cr. Denton requested clarification as to why this is not permitted. Ben Jones advised that passengers are not permitted take-a-way coffee cups through the screening point as there is no way for screening staff to verify the contents of the container i.e. is there a prohibited or dangerous item concealed within the container. The contents cannot be x-rayed as the risk of the cup spilling its contents inside the x-ray machine is too great. This is standard procedure for all screened airports in Australia. Ben Jones advised that the secure apron signage located on the light pole at the edge of the General Aviation (GA) apron has been located to a more visible location. The intent being that it will be clearer for GA users to see the signage advising not to cross from the unscreened apron to the screened apron. Ben Jones advised that Council nominated Roma Airport for the Regional Airport of the Year Nomination under the category ‘Regional Airport of the Year – 50,000 to 499,999 passengers’. Roma did not win, however was highly commended as a significant and incredible achievement. Cr. Denton requested an update on the terminal development. Ben Jones advised quotes have been requested for the detailed design of the development. The quotation will include full costs, timeframes and architectural, electrical, plumbing and environmental planning. The quotes are required back by 13th October. The committee requested an update on the Mitchell Airport fence. Ben Jones advised that he is still awaiting quotations from contractors regarding the fence. Robert Lethbridge noted that he has been told of poor reception within the Roma Airport terminal and enquired as to any reason this might be occurring. Ben Jones advised he will consult with Telstra on this issue and report back once he receives advice from Telstra. Robert Lethbridge also noted that the flight boards in the terminal is not up to date, which has lead to confusion for passengers boarding flights. Ben Jones advised that a recent QantasLink audit found a fault with the flight boards and a job has already been logged with the appropriate company. The committee advised Ben to monitor this to ensure the issue is resolved. The committee discussed change of venue to Council Chambers for meetings for ease of access. The committee agreed that this was the best location. It was decided that the next meeting would still be held at the Roma Airport so the committee could see the new kiosk once it was complete. Greg Shaw enquired as to how often the runway and apron were swept as he found mental in his aircraft tyre on Monday 30th September (mid morning). Ben Jones advised that this task was completed once a week, but would follow up with Greg to advise when the last time this task was completed. The Health Partnership Council for the South West region of Queensland is a voluntary, collaborative, communicative and responsive group for primary health care initiatives in that area. Members will work together to drive, inform and oversee the collaborative planning, development, implementation and review of commonly agreed health care service integration objectives and activities. The goal of the South West Health Partnership Council is to facilitate improved health outcomes for residents through integrated, seamless systems. • Regularly review areas of interest identified to maintain the relevance and usefulness of discussions. • Maintain a health service map for the SW region outlining all services provided and by whom to identify gaps in services and areas of duplication. • Supporting an adequately trained and skilled workforce. • Creating a shared platform of health information for consumers. • Maintain respect for member colleagues, their organisations and agendas. This Agreement covers the period 23 October 2013 to 31 December 2014. Other organisations may be invited to provide expert advice to the Partnership Council, as required. • The Chair is to be re-elected by the Partnership Council members at the annual planning meeting. • Will be a minimum of four times a year, of which one meeting will be a dedicated annual planning meeting. o record minutes and distribute them to all members within five working days of the meeting. • Meetings may be rotated across towns in the SW region with the option of members tele/videoconferencing in for attendance. • Council will aim for at least one (1) meeting per year where all members are in attendance for planning purposes and evaluation of council performance. • Decision making will be by majority vote by the members only after optimal consultation of all members has taken place. The South West Health Partnership Council will review this agreement annually on the dedicated planning day. Organisational and personal interests or biases are to be declared at the commencement of each meeting. Generally, if the member has an organisational bias, once it is declared, the member will be able to continue to participate in discussion. However, if it is a private interest that is declared, the Chair may direct the member to exclude themselves from participating in the relevant discussion. Should a member group wish to terminate their membership a letter advising of such should be tabled stating same at the next meeting of the SWHPC. South West region includes the Local Government areas of Maranoa, Balonne, Paroo, Quilpie, Bulloo and Murweh. · Cubic metre prices have been calculated using the volume/weight conversion factor tables provided by EHP. Map - D13/56230 Map - area covering Special Lease 200690, being Lot A on DL419 - Reserve for Gravel purposes. 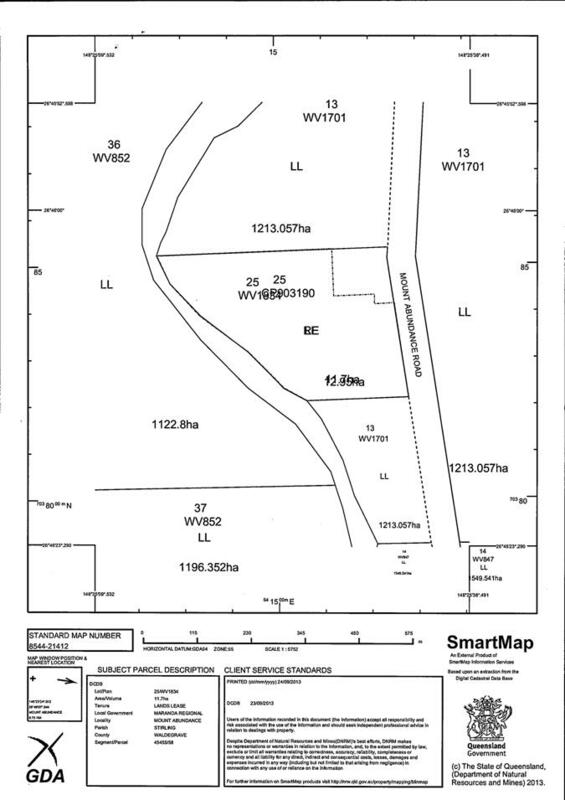 Map - area covering Term Lease 221644, being Lot 25 on WV1834 - Reserve for Water purposes. 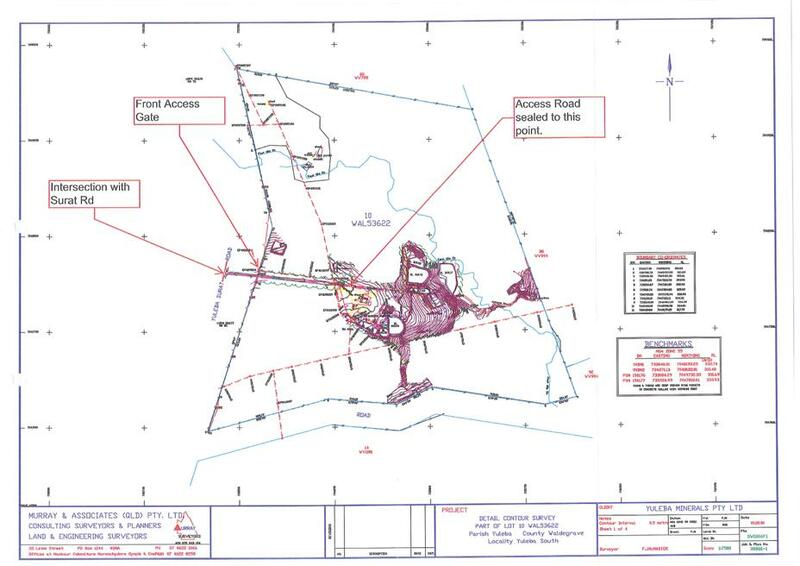 Map - area covering Term Lease 221757, being Lot 10 on TM47 - Reserve for Camping & Water purposes. Map - area covering Term Lease 221464, being Lot B on EG266 - Reserve for Camping & Water purposes. 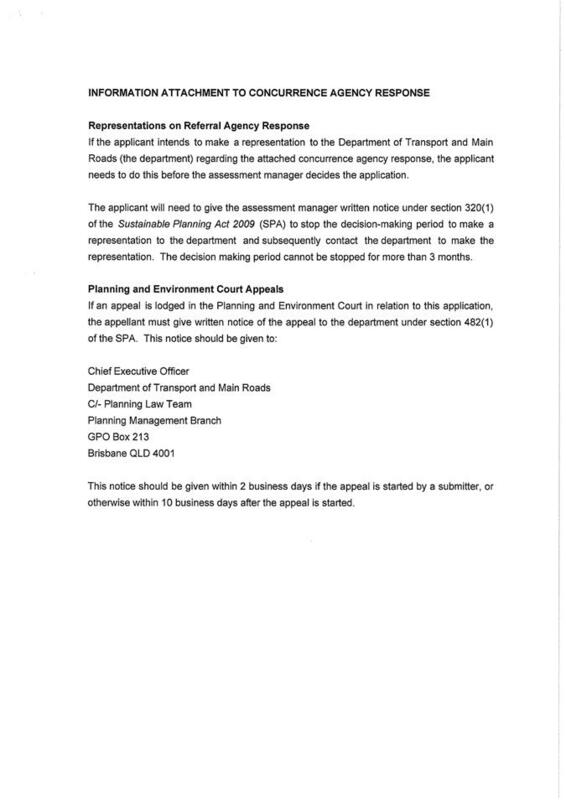 The applicant seeks a Development Permit for a Material Change of Use to establish an “Extractive Industry”, on land at “Ballaroo” 44 Begonia Road, Roma (described as Lot 5 on SP106996). The development involves extracting between 5,000t to 100,000t of quarry material per year from the “Ballaroo North Pit” (involving an operational area of approximately 52ha within a 4,510ha lot). The quarry material extracted is intended for civil construction purposes. The operation utilises excavators, front end loaders and bulldozers. 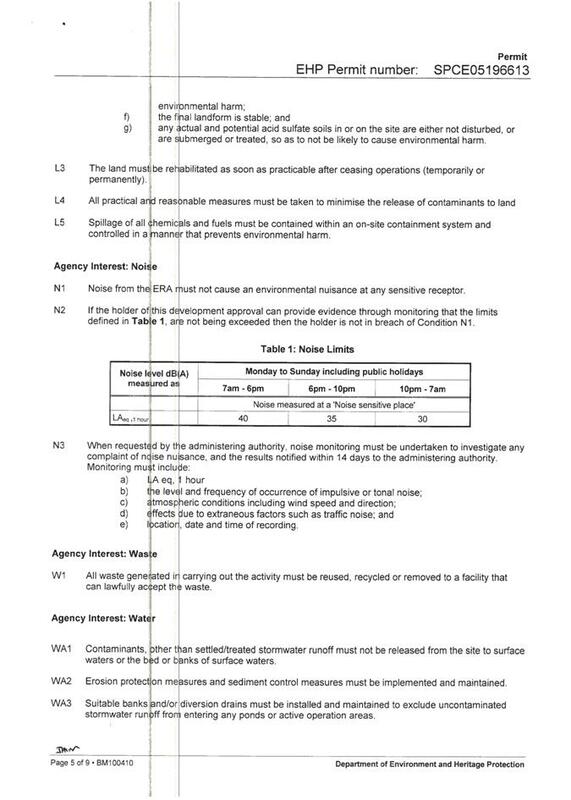 No screening activities are proposed on-site, and the activity does not require blasting. The proposed hours of operation are between 6:00am to 6:00pm, 7 days a week. The operation requires a maximum of two (2) employees on-site at any one time. The site will gain access from Southern Road along the eastern boundary. The quarry material will be transported on road trains equipped with side tripper trailers. The haulage route will be predominantly north on Southern Road to Roma, using an intersection onto the Warrego Highway. The anticipated traffic generation is approximately 2,200 trips per annum of the heavy vehicles, and 730 trips of light and service vehicles. The activity does not require permanent service connections, and proposes for an on-site amenities block. The waste generated will be removed and treated off-site. The site is situated within the Rural Zone, on a lot with an area of 4,510ha. There are no sensitive receptors within 1000m of the site (the nearest being a homestead 2.8km to the north-east). The site is not located within 100m of a watercourse. 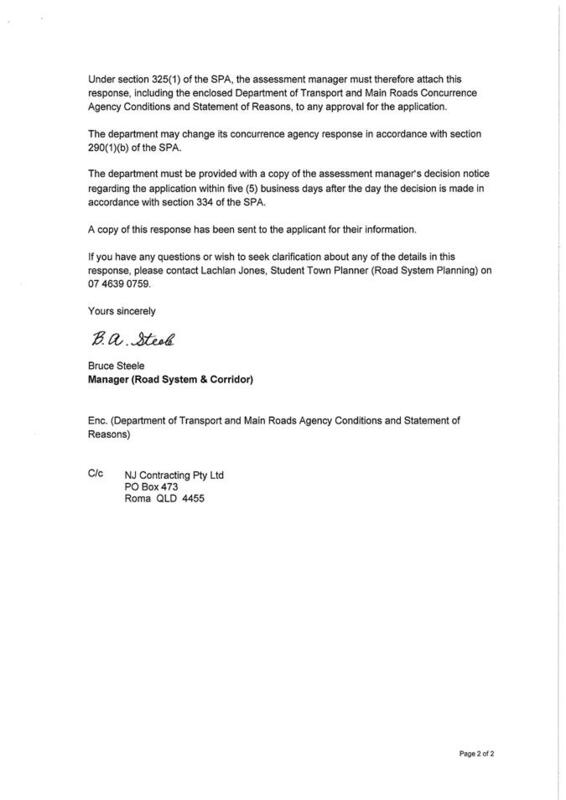 The Department of Transport and Main Roads assessed the application in relation to impacts on State-controlled road infrastructure, and issued concurrence agency conditions of development (refer Attachment 2). 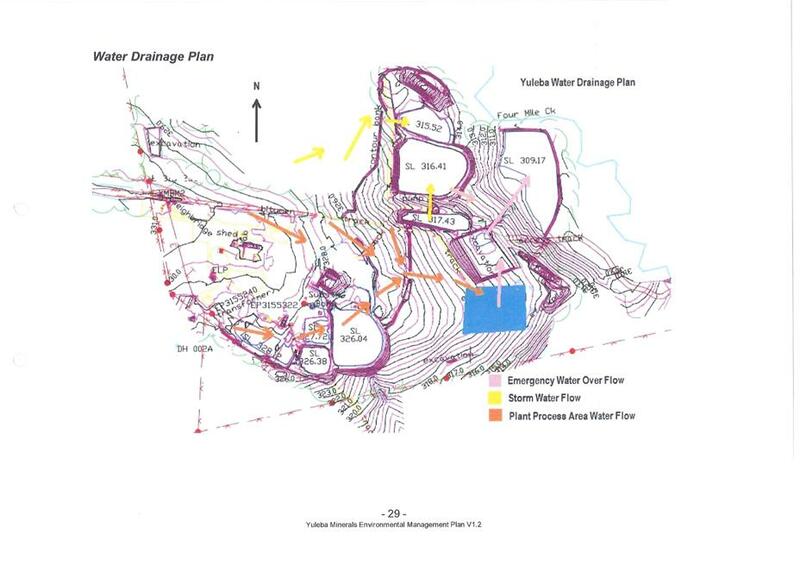 The development application material submitted to Council included an Emergency Response Plan, an Activity Based Management Plan, and an Environmental Management Plan. 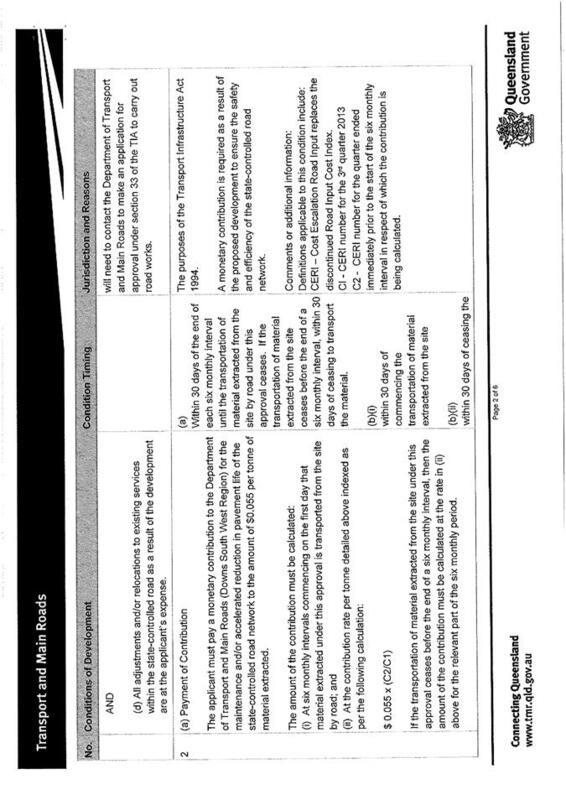 Refer to Attachment 3 for the Proposal Plans. (h) any work, administration or accounting in connection with any such activity. The term does not include the winning and processing of minerals authorised under the Mineral Resources Act 1989. 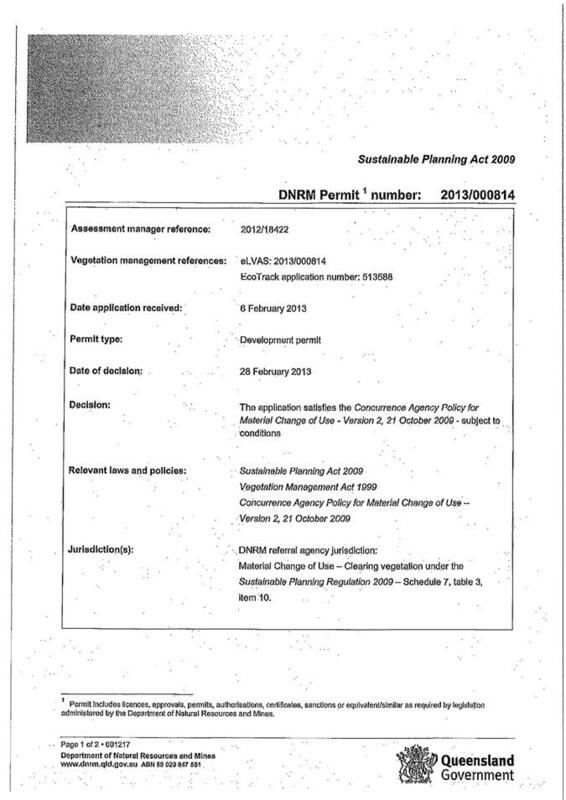 The application is subject to Impact Assessment and assessed against the relevant provisions of the planning scheme. Public Notification was carried out from 6 September 2013 to 27 September 2013. No submissions were received during this period. a. The Shire has a predominantly agricultural-based economy. Future economic activity has built on the Shire’s agricultural and other natural resources (including gas, minerals and extractive materials). The proposed development is for an extractive industry, contributing to the needs of civil construction within the region. b. Other non-agricultural/ non-natural resource-based forms of land use or development have not compromised the ecologically sustainable use of the Shire’s economic resources. 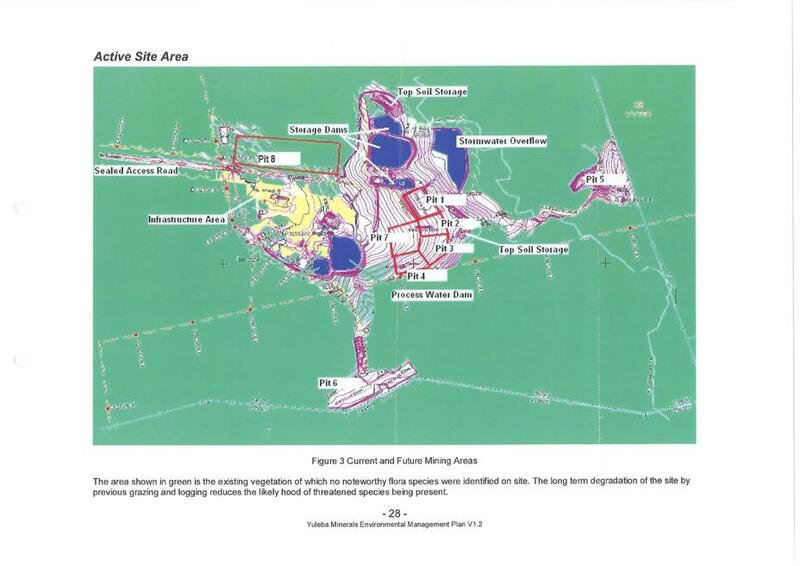 The proposed development involves the extraction of a natural resource (quarry material). c. The tourism industry is based on the Shire’s location, cultural heritage and rural character. The proposed development will not detract from any tourism activities within the region. d. The Shire is economically strong and is an attractive place to live, work, conduct business and visit. The proposed development provides for a product (quarry material) needed for civil construction purposes, thereby contributing to growth of the regional economy. v. Outlying settlements have consolidated and include a range of low-order community facilities and services meeting local resident needs. The proposed development is a relatively low impact industry (no blasting involved), and can be appropriately conditioned to mitigate any environmental impacts. b. Places of cultural heritage significance in the Shire are effectively conserved. New development has sensitively responded to these places. The subject site is not located in proximity to any known places of cultural heritage significance. c. A range of business ventures have established including home occupations. The Shire’s urban and rural communities are provided with services, facilities and employment opportunities that meet community needs. The proposed development provides a product (quarry material) needed for civil construction purposes, and therefore satisfies a general community need. d. The town of Surat, together with outlying settlements, provide a strong community focus. The proposed development will not impact adversely on the town of Surat or the outlying settlements. e. Physical and social infrastructure is efficiently provided at sufficient levels that maintain acceptable environmental standards. The proposed development can be appropriately conditioned to require that all necessary infrastructure components are provided. f. The Shire has transport corridors and facilities, including the aerodrome, that facilitate safe and efficient movement of people and goods. The proposed development includes a suitable haulage route. The Department of Transport and Main Roads have assessed the application in terms of State-controlled infrastructure and have provided concurrence agency conditions of development. g. A network of local roads and a mix of land uses provide for maximum accessibility for pedestrians, cyclists and public transport. The proposal does not include the construction of any new roads. h. Development is located and operated in a manner that minimises risks and hazards, such as bushfire and flooding and impacts on surrounding uses. The proposed development includes an Emergency Response Plan, an Activity Based Management Plan, and an Environmental Management Plan. These plans will be included in the conditions of development to address any hazard risks. i. Conflicts between different activities in urban areas have been minimised. 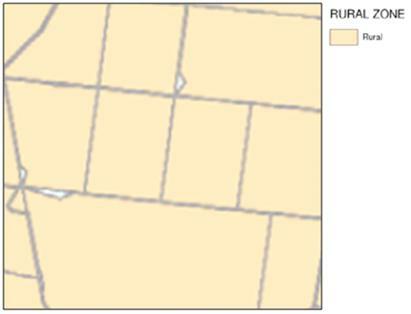 The subject site is located within the rural area. j. On-going activities in industrial and commercial areas operate to high environmental standards. iv. adverse environmental impacts have been avoided or minimised. The subject site contains remnant vegetation and a watercourse; however the proposed activity will be undertaken outside these areas and provides for a suitable buffer. The development can be conditioned to address matters relating to mitigating any environmental impacts. v. flood plains have been managed to ensure natural drainage regimes are conserved and flooding risks are minimised. The subject site is identified as containing Class A and Class 2 agricultural land; however the proposed activity will be carried out only within the Class 2 area (minimal agricultural potential, suited for nature forestry). The proposed development is suitably located within the rural area, will operate within a relatively small portion of the site, and will not prejudice the balance area from being utilised for agricultural purposes. a. Land within this area is primarily intended for a range of rural purposes, including grazing and some irrigated and dry-land agriculture activities, suited to topographic and climatic characteristics. Given that the proposed development is for an extractive industry for a resource predominantly found within rural areas, and that the development can be appropriately conditioned to address any matter relating to environmental and amenity impacts, it is considered that the proposed use is suitable for the site. b. Within this zone, new intensive and rural based industries will be buffered and sufficiently separated from the Shire’s towns, villages and rural residential communities. It is intended that such intensive and rural based industries do not adversely impact on the amenity or infrastructure of these areas. The proposed development is suitably located in terms of providing a buffer to existing townships and sensitive receptors. c. Industrial uses associated with rural production, or which have requirements such that they could not be located in the Industry Zone, may be permitted. It is intended that such development will have minimal impacts, environmentally and otherwise, on surrounding areas. The development of extractive industries may also be favourably considered, where they would not unacceptably impact on the Shire’s infrastructure, environmental assets, and natural resources. Industry uses are to provide arrangements to ensure an appropriate level of access and other services. d. It is intended that commercial uses will perform a service to the travelling public, add value to primary products, or otherwise have a need to be located on the proposed site to serve the local needs of the surrounding rural area. However, the Commercial Zone in the town of Surat is the primary focus for commercial development. Not applicable. The proposal is for an industrial use (extractive industry). e. It is intended that tourist-related uses developed in this zone be suitably buffered from agricultural land uses, do not alienate good quality agricultural land from production, and do not result in adverse environmental impacts. The development of tourist uses that complement rural activities, or otherwise are rural-themed, are supported. f. Council will not support any proposal that would result in unplanned expansion of the town of Surat or would otherwise result in a lack of orderly development. Notwithstanding this, facilities and services are encouraged in existing outlying settlements where they would consolidate such communities, and where the services would otherwise provide for the local or convenience needs of residents. Not applicable. The proposal is for an industrial use (extractive industry), and does not constitute an unplanned expansion of a town or out-of-sequence development. g. Development at an urban scale, and rural residential development, is not intended for this Zone. Development involving subdivision in this Zone must have regard to long-term farm viability and the carrying capacity of land holdings. a. Certain land within this zone has been identified as good quality agricultural land in accordance with State Planning Policy 1/92: Development and the Conservation of Agricultural Land; and the associated Planning Guidelines: The Identification of Good Quality Agricultural Land. b. Mapping of good quality agricultural land resources has been by the Department of Natural Resources and Mines. Land is defined in four classes and these are identified in Map 3 – Agricultural land Classification. Where required, it is expected that detailed or site specific investigations would more clearly define the extent of good quality agricultural land. Not required. The proposed development will be carried out over land identified as Class 2 GQAL and will not prejudice the balance area of the site from being utilised for agricultural purposes. c. It is intended that any proposed development would facilitate the productive use of the land or will provide for its conservation or sustainable use in the longer term. All land within this area is to be protected from development that would result in either its fragmentation, alienation from agricultural use or diminished productivity. The proposed development will be carried out over a relatively small portion of the overall site (an operational area of 52ha within a 4,510ha lot) and will not prejudice the balance area of the site from being utilised for agricultural purposes. d. The amalgamation of land titles will be encouraged in order to facilitate more co-ordinated land management practices and to preserve agricultural options in the longer term. Not applicable. The proposed development does not involve the reconfiguring of a lot. · alteration or repair to existing road pavements, kerb and channelling, footpath or drainage works, required as a result of the construction works for the development at no cost to the Council or other road authority. The site will gain vehicle access via Southern Road. The development can be conditioned to address any matters relating to vehicle access. The Department of Transport and Main Roads have assessed the development in relation to impacts on road infrastructure and have imposed conditions of approval. S2 A safe and reliable supply of potable and general use water is provided for each premises including, where available, connection to an approved reticulated system. 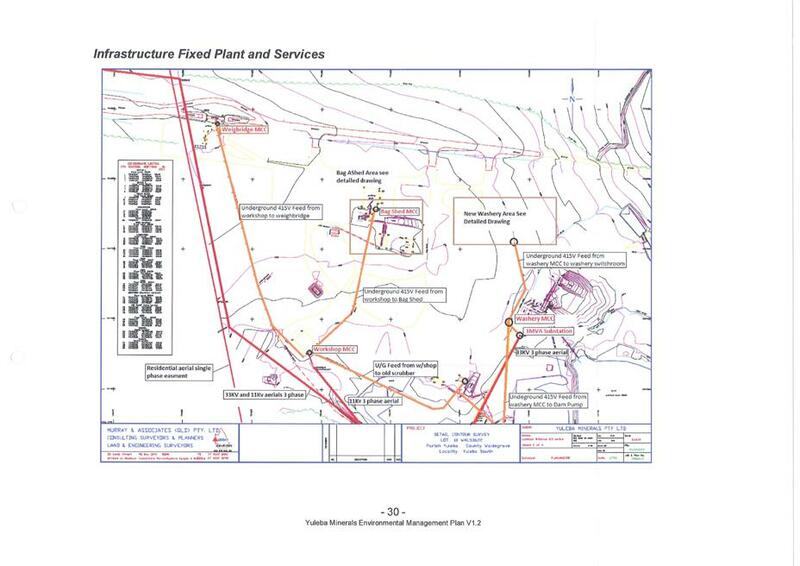 The site is located outside of Council’s reticulated water supply system area. Given the nature if the activity, only a minimal water supply is required. The development can be conditioned to address any matters relating to a water supply. · limit the sustainable disposal of domestic effluent. The site is located outside of Council’s reticulated sewerage system area. Given the nature of the activity, a permanent effluent disposal system is not required. The development can be conditioned to address any matters relating to effluent disposal. S4 Electricity and telephone services are provided in a timely, cost effective and efficient manner. Given the nature of the activity, a constant electricity supply or connection to a landline are not required. The proposal includes the use of a portable / mobile generator (when required), and the use of CB Radios and mobile telephones. S5 On-site drainage does not adversely affect adjoining land or the downstream stormwater system. The proposed stormwater management includes the use of a diversion bank on the uphill slope of the site. Water will then be diverted into a nearby grazing paddock for dispersal. Stormwater from within the site will be retained in a sump and will be used for dust suppression. Any excess water will be diverted into a nearby grazing paddock. The development can be conditioned to address any matters relating to stormwater management. Matters relating to environmental impacts will be assessed by the Department of Environment & Heritage Protection as part of the ERA application. S6 Security of tenure for rights to convey and/or discharge stormwater is obtained. Any collected stormwater is to be dispersed within the subject site. Not applicable. The proposal does not include any permanent buildings or structures, and will not affect any major drainage network. S8 Alterations and/or repairs are provided by the developer to public utility mains, services or installation and drainage works where necessitated by building, operational or drainage works for the premises. Not applicable. The proposal does not include any works on public utilities. · the capacity of the adjoining street system. The proposed activity is located on a relatively large lot within the rural zone, with sufficient area for vehicle parking and manoeuvring. The proposed access point is onto Southern Road. The development can be conditioned to address any matters relating to vehicle access. The site provides a sufficient area for vehicles entering and exiting the site in a forward gear, and for a suitable on-site circulation system to be put in place. S12 Functional on-site vehicle parking is provided in convenient, attractive and safe locations. The site provides sufficient area for on-site vehicle parking. S13 Sufficient on-site vehicle parking spaces are provided to accommodate the amount and type of vehicle traffic to be generated by the development. The planning scheme does not prescribe a specific number of carparking spaces for an extractive industry. Given the nature of the activity (requiring only two employees) and the large size of the site, it is considered that sufficient parking area are available. · do not adversely impact on the visual significance of the site. The proposal can be appropriately conditioned to address any matters relating to earthworks. · ensure the stability and longevity of the retaining walls and batters and the safety of people and properties. S16 The environmental values of receiving watercourses are protected. The proposed development provides for an appropriate buffer area to watercourses. S17 Earthworks and excavations do not encroach upon or disrupt utility services. S18 Landscaping is provided to a high quality appearance and improves the visual amenity and streetscape values of the area. Given the nature of the activity (relatively low impact extractive industry) and the location of the site (with the closest homestead being approximately 2.8km to the north-east), it is considered that landscaping is not required. · is for a recognised community organisation or activity/project. The proposed signage is minimal. S20 Signage is constructed in a manner to ensure public safety. The proposed sign is less than 3m in height above ground level and less than 5sqm, therefore does not require an engineering certification. S21 Outdoor lighting does not detrimentally affect the safety or wellbeing of any pedestrian, cyclist or motorist through inappropriate light emissions from development that reduce the ability of transport users to see essential details of the route ahead, including signage. Not applicable. Lighting is not required. · does not cause unreasonable disturbance or nuisance because of emission of light. S23 Outdoor sports lighting meets the visual requirements of the use and does not cause an unreasonable disturbance of nuisance to adjoining uses because of light emissions. Not applicable. The site is not located within 100m of the Surat Aerodrome. · avoid other adverse impacts on the site or the surrounding area. The applicant has submitted an Emergency Response Plan, an Activity Based Management Plan, and an Environmental Management Plan. S2 Development maintains visual amenity and rural character. The proposal is a relatively low-impact extractive industry (not requiring blasting), and will not impact adversely on the locality (the closest homestead being 2.8km to the north-east). The development can be conditioned to address any matters relating to impact on amenity. · preserve or enhance the amenity of adjoining land. The proposed development will occupy a relatively small portion of the lot, can be conditioned to mitigate any impacts on local amenity, and therefore will not impact adversely on the local character. S4 The development does not impact on the amenity of the locality. The development can be conditioned to address any matters relating to protecting the local amenity. S5 The development does not impact on remnant vegetation through grazing or edge effects, such as weed or pest infestation. The proposed development provides for a suitable buffer (minimum 100m) to areas identified as remnant vegetation. S6 Development on properties containing the designated gas pipeline provide a suitable separation distance between the development to maintain pipeline integrity and safety. Not applicable. The site does not contain a designated gas pipeline. Not applicable. The site is not identified as containing any cultural heritage value. S8 Buffers of sufficient width are provided to ensure the conservation of the watercourses designated on Map 1a. The proposed development provides for a suitable buffer (minimum 100m) to watercourses. S9 Non-rural activities are designed, sited and managed to avoid loss of good quality agricultural land and minimise conflict with agricultural uses. S10 Extractive resources and operations are protected from development that sterilises these extractive resources and operations. Not applicable. The proposed development does not include a sensitive receptor. environmentally sustainable disposal of on-site wastes, including waste-water, so that there are no significant adverse impacts on the quality of any surface water or ground water resource. The development can be conditioned to address any matters relating to provision of any infrastructure components. Not applicable. The proposal does not include a caretaker’s residence. Not applicable to the proposed development. The development can be conditioned to address any matters relating to site access and safety. S2 The impact of extractive industries on roads is minimised. 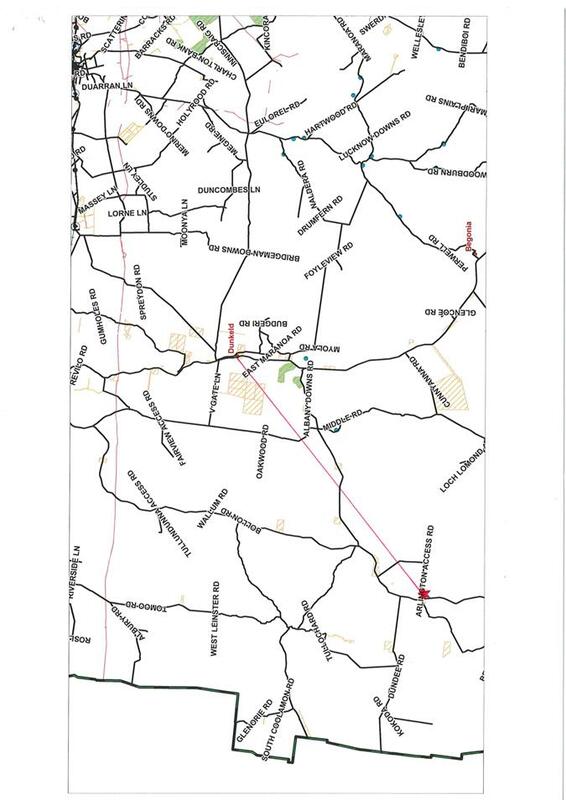 The proposed haulage route is north onto Southern Road to Roma, intersecting with the Warrego Highway. The development can be conditioned to address any matters relating to road infrastructure. The Department of Transport and Main Roads have assessed the application in terms of State-controlled infrastructure and have provided concurrence agency conditions of development. S3 The extractive industry ensures that the general amenity of the locality is protected. hydrological processes are adequately mitigated. Matters relating to the mitigation of the environmental impacts will be assessed by the Department of Environment & Heritage Protection as part of the ERA application. The development can be conditioned to address any matters relating site rehabilitation. Public notification was carried out between 6/9/13 and 27/9/13, and no submissions were received. 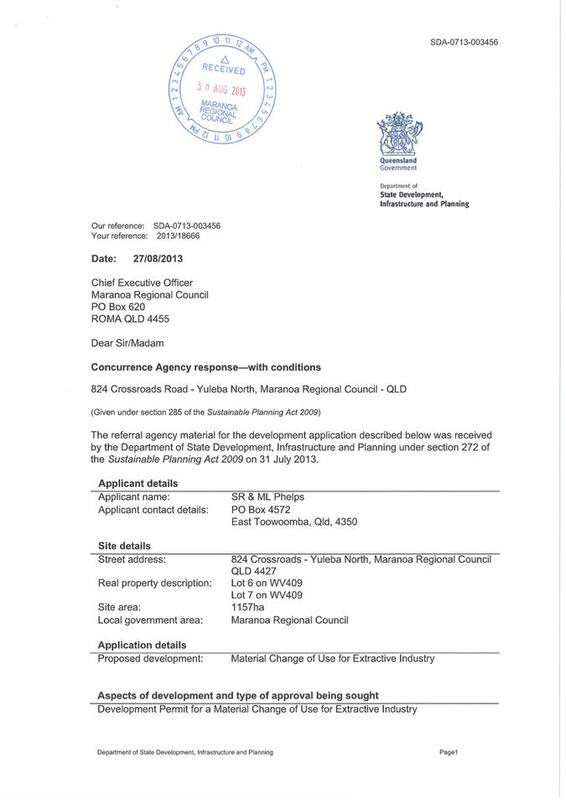 Although the planning scheme requires Impact Assessment for the proposed use, there is no conflict with the intent of the Warroo Shire Planning Scheme. The development is a relatively low impact activity appropriately located within the Rural area. The development is consistent with the amenity of the immediate locality and will not prejudice rural activities within the Rural Zone. The proposed development is for “Extractive Industry”, being two pits for the extraction of gravel for civil construction purposes. The activity involves the extraction of between 5,000t to 100,000t of gravel per annum, with the two pits having operational areas of approximately 25ha and 30ha respectively. The activity involves strip mining techniques, excavating to a depth of approximately 3000mm, with no blasting required. As well as extraction, the activity includes the crushing, screening, stockpiling and distribution of gravel material. The activity does not require any permanent buildings or structures, and includes the use of moveable offices and amenities on site. The site currently contains a dwelling house, to be used as a caretaker’s residence. The activity requires a maximum of six (6) employees on-site at any one time, and two (2) off-site in administration. The proposed hours of operation are 6:00am to 6:00pm, Monday to Saturday. 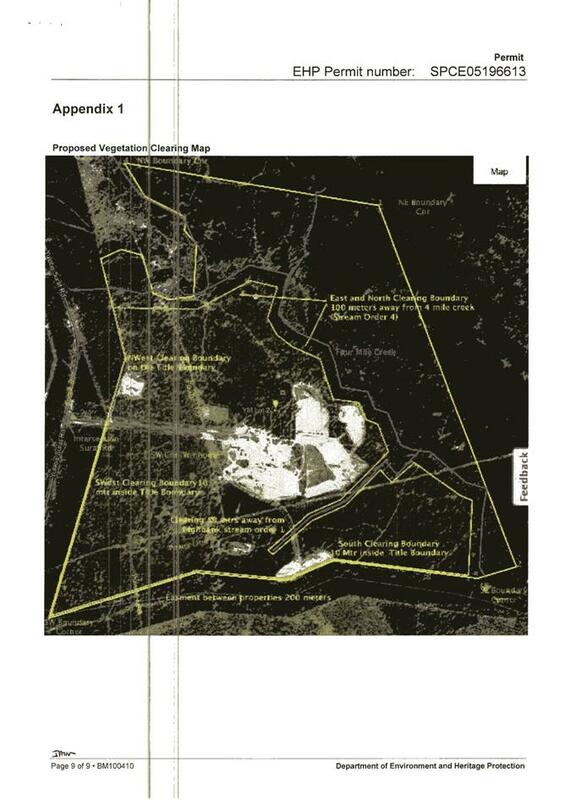 The proposal includes three vehicle access points (one for each pit and one for the residence), one onto Crossroads Road, along the northern boundary of the site, and two onto a road reserve along the eastern boundary. The activity requires the use of “truck and dog” haul trucks and double road trains, with an estimated frequency of 5,000 and 625 annual movements respectively. The anticipated haul route will predominately be west from the site along Crossroads Road, then turning either north or south at the intersection of Horse Creek Road. A small portion will travel east from the site, and terminate their trips before using any state-controlled roads. 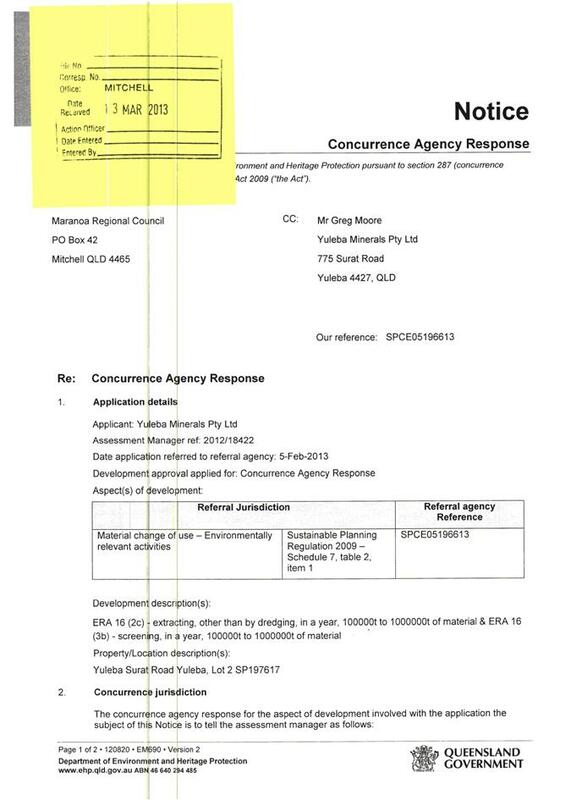 There are no sensitive receptors located within 1000m of the proposed work areas, other than the existing residence on-site located approximately 515m south of a pit. The proposal does not include clearing of any remnant vegetation, and will maintain a buffer area to significant vegetation and watercourses. The applicant has provided a Site Based Management Plan, prepared by Struxi Design Pty Ltd. 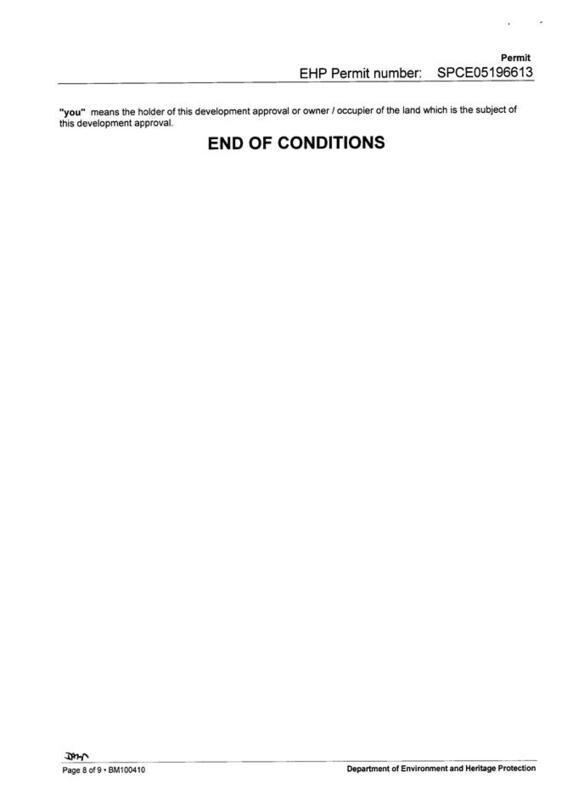 The State Assessment & Referral Agency as a Concurrence Agency for the development have carried out an assessment in relation to any potential impacts on transport infrastructure, and have issued conditions of development (refer to Attachment 2). 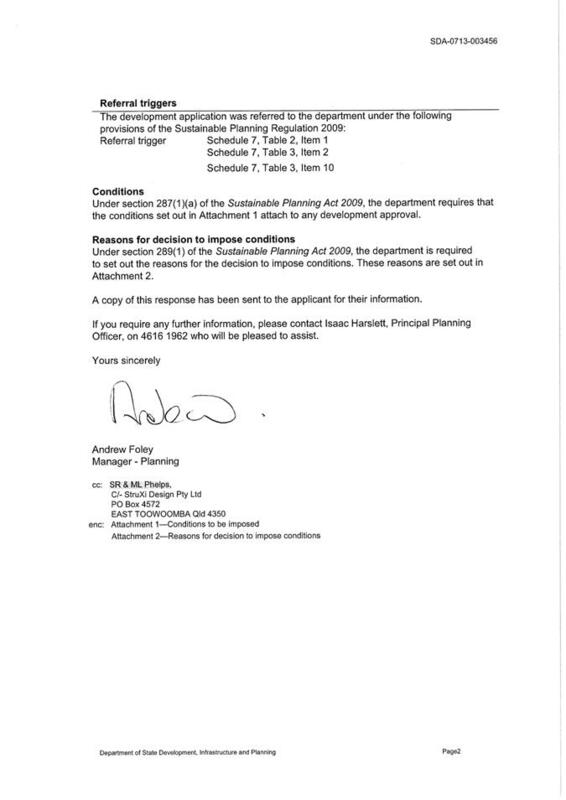 Although the proposed development constitutes an “environmentally relevant activity” under the Environmental Protection Act 1994, the proposed thresholds do not constitute a “concurrence ERA” under the Sustainable Planning Regulation 2009, and therefore does not trigger referral. 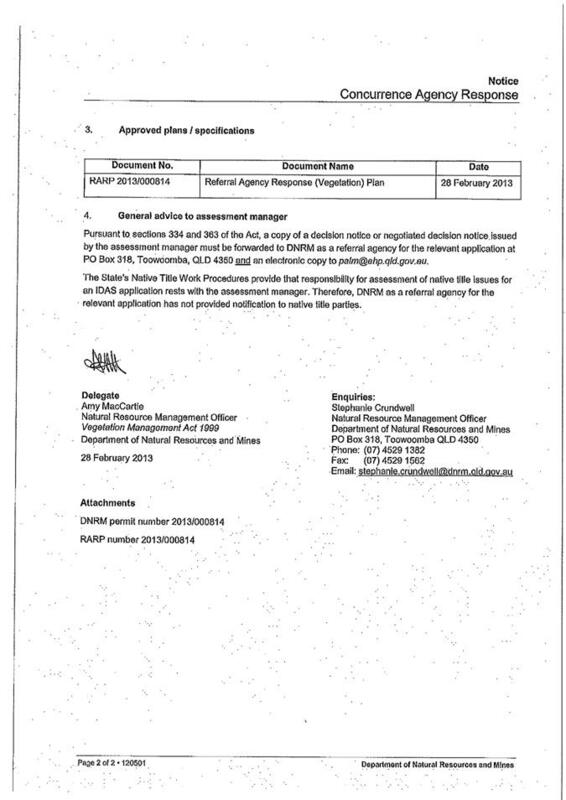 An application for the relevant Environmental Authority is to be submitted to the Department of Environment & Heritage Protection as a separate application. "Extractive Industry" means any premises used for the winning or treatment on the land or on adjacent land, of gravel, rock, sand, soil, stone, or other similar materials. The term does not include the removal of materials authorised by Section 32(13) of the Local Government Act 1993, or mining within the meaning of the Mineral Resources Act 1989. “Material” includes clay, gravel, loam, rock, sand and other substance found in the earth. 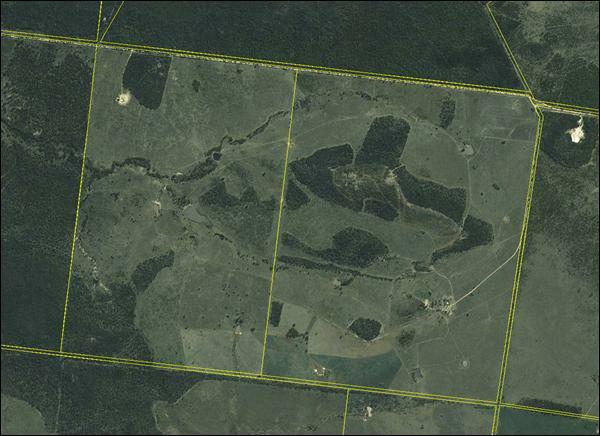 The site is situated at land at 824 Crossroads Road, Jackson North QLD 4426, and described as Lot 6 & 7 on WV40 (refer Figure 1 - Locality Plan, and Figure 2 – Site Boundaries). 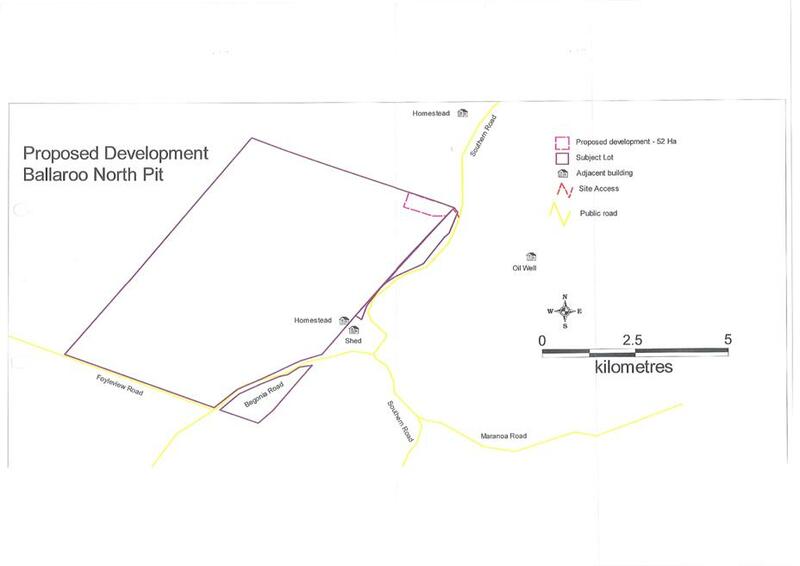 The site is situated in the Rural Zone of the Bendemere Shire Planning Scheme 2006 (refer Figure 3 - Zoning). The site is predominantly vacant and contains a dwelling house (situated approximately 515m south from proposed pit 2). 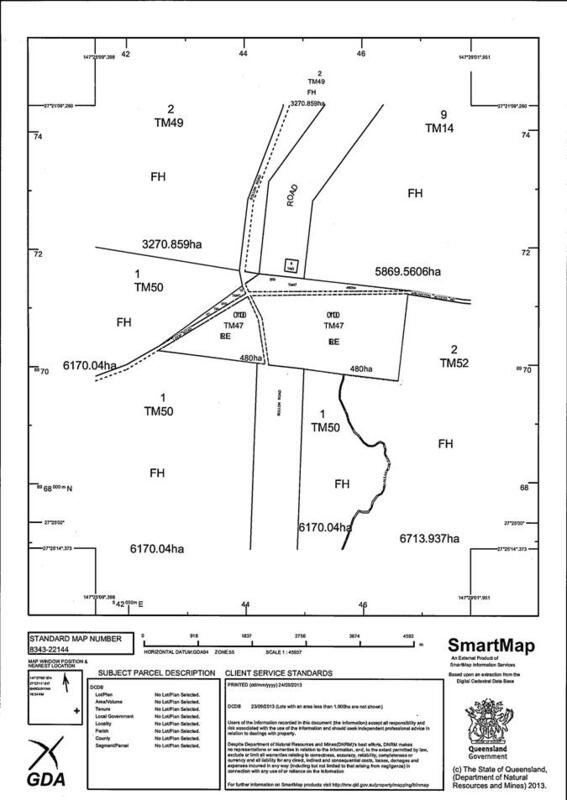 The surrounding land uses are predominantly rural grazing land, including homesteads, and also resource sector activities – the Woleebee Lateral Pipeline is planned to be located north of the subject site, running east-west (refer Figure 4 - Aerial Photograph). Public notification was carried out from 6 September 2013 to 27 September 2013. No properly made submissions were received during this period. The site is identified as containing portions of remnant vegetation. The proposal includes a buffer area, and will not result in the removal of any vegetation, or impact on any other adjoining environmentally significant areas, including wetlands, habitats, corridors and open spaces. Any environmental impacts, in terms of ecological sustainability, can be appropriately controlled by way of the mitigation measures detailed in the Site Based Management Plan, and by way of conditions of development. (i) Good Quality Agricultural Land (GQAL) is protected as a major economic resource for the region. Portions of the site are identified as containing GQAL. The proposed development represents a resource which is predominantly located within rural areas. The proposed development will be operated within two relatively small sections of the site and will not adversely impact on the ability of the balance area of the site to be used as grazing land. The proposed development includes an Extractive Industry use, being gravel pits for extraction of material for civil construction purposes. The proposed development will enhance the economic resources within the region. The proposed development will service the community and region by establishing two gravel pits for the extraction of material for civil construction purposes. The proposed development will encourage economic activity within the region. The proposed development will gain vehicle access to the existing road network via the Crossroads Road and an unnamed road reserve. Due to the nature of the use, the site will be provided with an electricity generator, on-site water storage and a temporary and relocatable sewerage disposal system. (ii) Rural residential and urban residential development occurs in distinct localities that provide a sense of community, amenity, services, and a safe, affordable living environment, whilst maintaining rural amenity of the shire. The role of Yuleba and Wallumbilla townships as the main business and community centres of the shire is consolidated. Given the temporary nature of the activity, permanent buildings and structures are not required. Therefore any adverse effects from natural hazards are considered minimal and can be appropriately mitigated. The proposed development is for a low-impact extractive industry, suitably located within the Rural Zone, and will not affect housing types within the region. The proposed development is for a quarry for the extraction of gravel, and will enhance the economic potential of the rural area. The proposed extractive industry is suitably located within the Rural Zone, and will not impact adversely on the surrounding uses. A portion of the site is identified as GQAL. The proposed development represents a resource which is predominantly located within rural areas. The proposed development will be operated within two relatively small sections of the site and will not adversely impact on the ability of the balance area of the site to be used as grazing land. The proposed development is of a scale and intensity that is consistent with both the rural area and the adjoining rural and industrial uses. Matters relating to environmental and amenity impacts can be suitably controlled by way of conditions of development, to ensure the protection of the rural amenity. The proposed development will be located within two relatively small areas within the site. 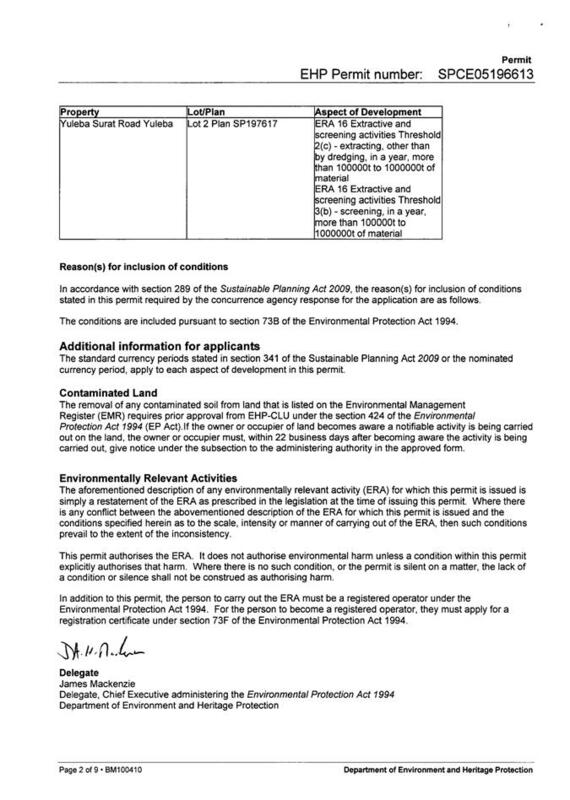 It is considered that subject to the recommended conditions of approval, the proposed development will not prejudice or adversely impact on other uses, including established uses within other Zones. The proposed development includes vehicle access points and connection to the road network, suitable for the use. The site is identified as containing protected areas (remnant vegetation), however the proposal includes suitable buffers to these areas. The existing residence is connected with appropriate infrastructure. An electricity generator, on-site water storage and a temporary and relocatable sewerage disposal system will be required as a condition of development. The site is identified as containing medium bushfire hazard risk areas. Given the nature of the development, it is considered that there is minimal risk to either people and property. Hazard mitigation can be appropriately addressed by way of conditions of development. On-site water supply and sewerage disposal system will be required as a condition of development. Any impacts on infrastructure can be appropriately addressed by way of conditions of approval. The existing residence is currently connected to an electricity supply. The proposed development will be provided with a generator to service the sites, which will be a condition of development. The existing residence is currently provided with a rainwater tank. The proposed development will be provided with a non-potable water supply (mainly for dust suppression) from the proposed sediment ponds and property dams. The two sites will be provided with temporary, transportable effluent disposable facilities. Conditions of approval will require effluent to be disposed of in accordance with Schedule 5 – “Standards for Sewerage Supply”. Stormwater and inter-allotment drainage will be required to be collected and discharged in accordance with the relevant standards, as a condition of development. 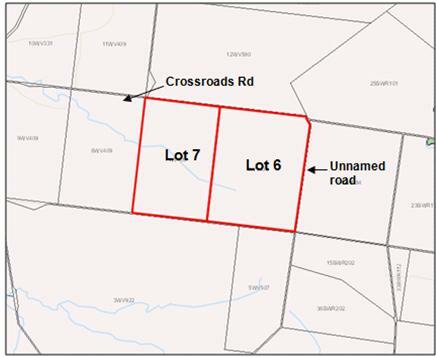 The proposed vehicle access to the gravel pits is via three separate crossovers – one onto Crossroads Rd along the northern boundary, and two onto an unnamed road along the eastern boundary. The internal site roads are to be gravel sheeted. The design and construction of vehicle access points and internal roads, and upgrades (where required) of the local road network will be addressed by conditions of development. N/A – The proposed development does not involve road construction. 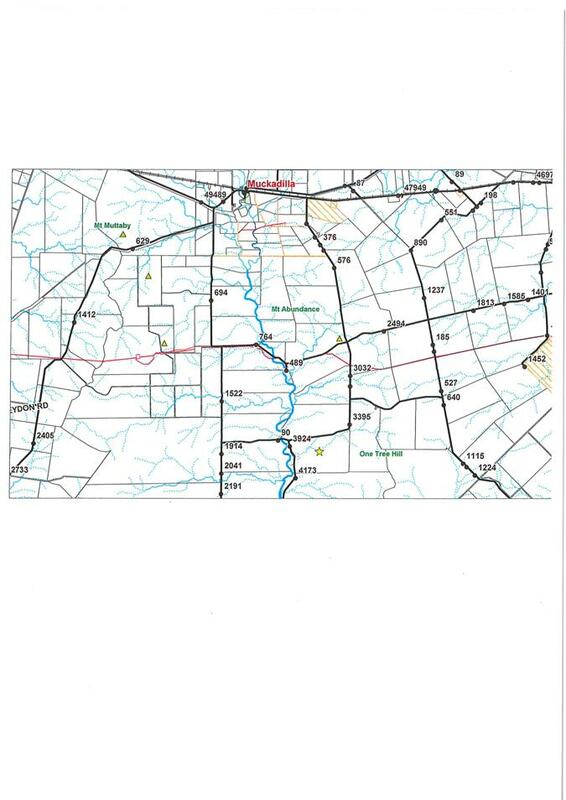 N/A – The proposed development is not located contiguous to a state-controlled road. 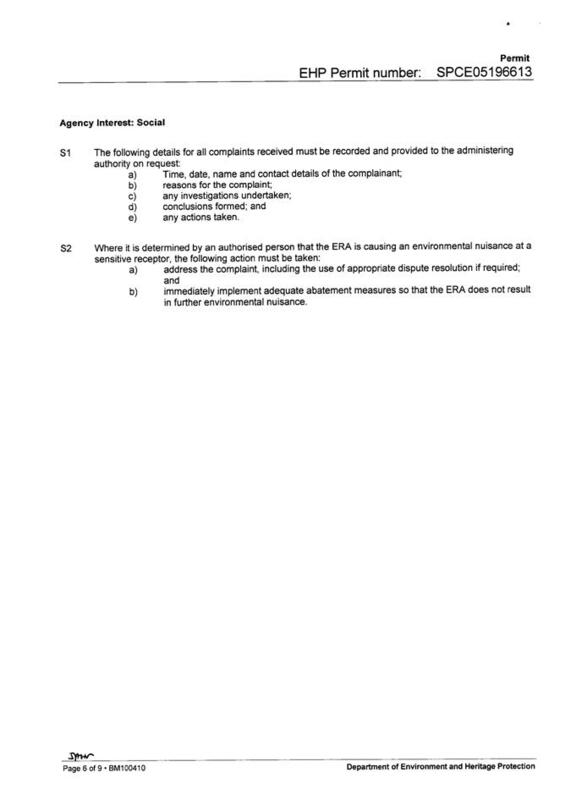 SARA was a concurrence agency for the application and have set conditions of development (refer to Attachment 2). N/A - The proposed development is not located within 100m of an existing pipeline. No building is to be constructed within 500 metres of a refuse tip or effluent treatment plant. N/A - The proposed development is not located in close proximity to any existing rail corridor. The proposed development will not be located within 10 metres of a high bank or watercourse. Matters relating to the mitigation of environmental impacts can be appropriately addressed in the conditions of development. The site is not identified as located within a known flood area. Matters relating to stormwater management can be appropriately addressed in the conditions of development. 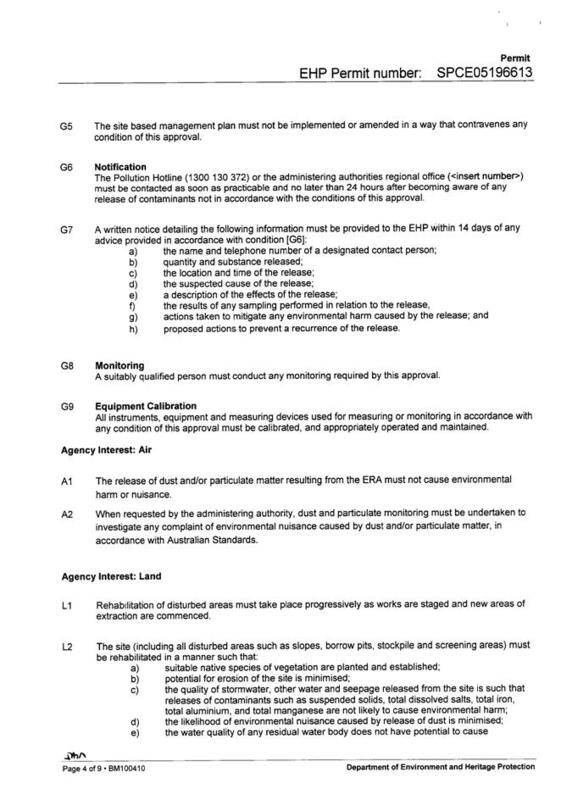 Air emissions are proposed to be managed in accordance with the Site Based Management Plan. Matters relating to minimising air emissions will be assessed by the Department of Environment & Heritage Protection as part of the ERA application. Noise emissions are proposed to be managed in accordance with the Site Based Management Plan. Matters relating to minimising noise emissions will be assessed by the Department of Environment & Heritage Protection as part of the ERA application. Matters relating to maintaining water quality will be assessed by the Department of Environment & Heritage Protection as part of the ERA application. Matters relating to excavation and filling can be appropriately addressed in the conditions of development. N/A – The proposed development does not involve any building works. The proposal includes appropriate buffer areas to significant vegetation. The proposal does not include clearing of remnant vegetation. No development is proposed to be undertaken on slopes greater than 15%. The site is identified as containing medium bushfire hazard risk areas. Given the nature of the development, it is considered that there is minimal risk to either people or property. Mitigation can be appropriately addressed by way of conditions of development. N/A – The development is not located in close proximity to any heritage or character buildings. N/A – The site does not contain nor is in close proximity to known places of indigenous and/or cultural heritage. 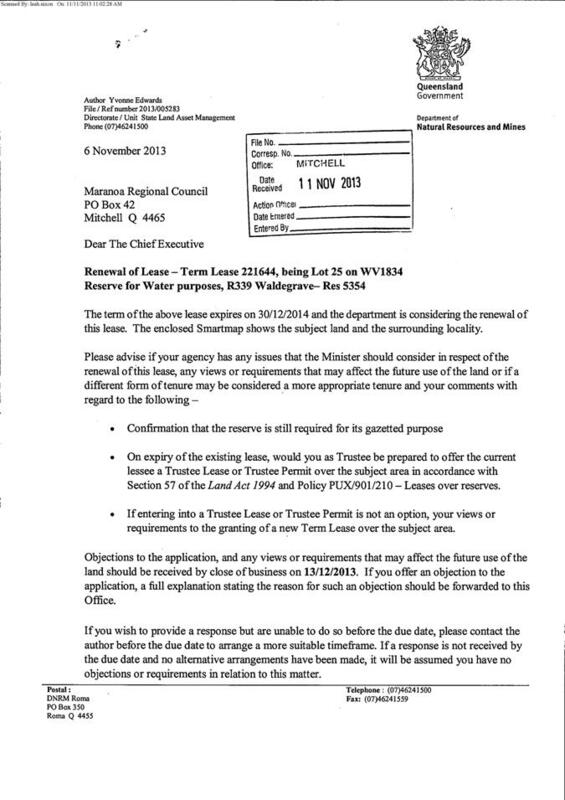 No submissions were lodged to Council during the public notification period (6/9/13 to 27/9/13). 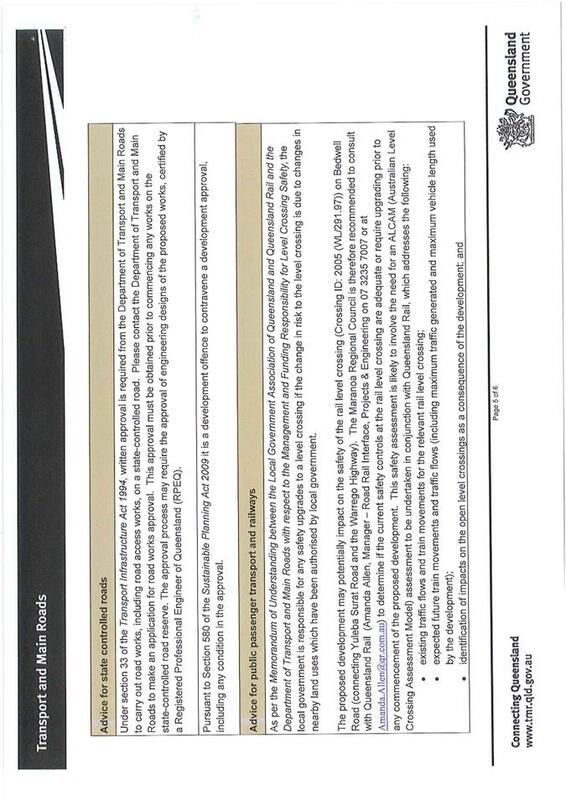 The State Assessment & Referral Agency response, dated 27 August 2013, includes conditions which form part of the approval (refer Attachment 2). 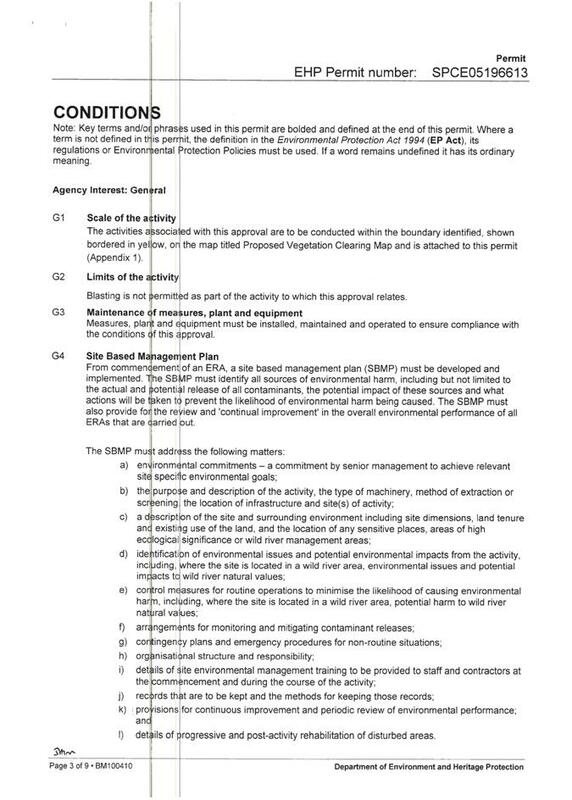 Approval for an Environmental Authority will be required in relation to the Environmentally Relevant Activity component. 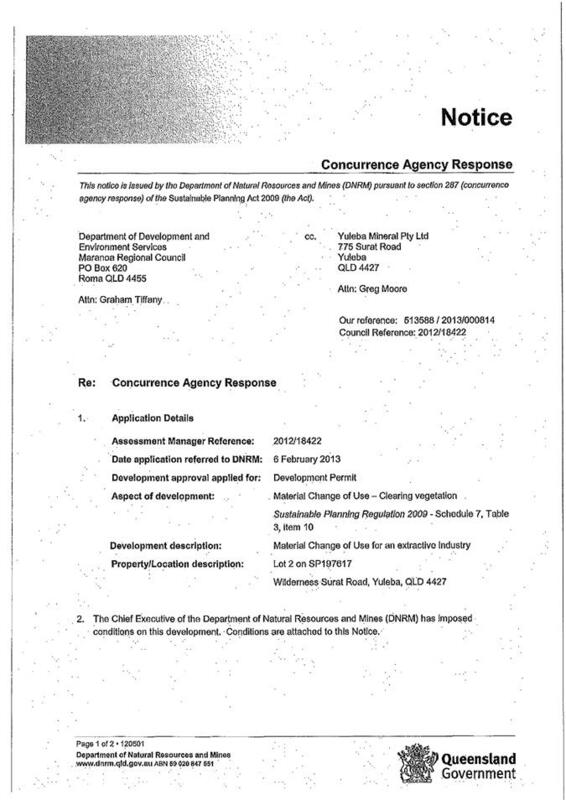 The application seeks a Development Permit for a Material Change of Use to expand an existing “Extractive Industry” and Environmentally Relevant Activity 16 – Extractive and Screening Activities, on land at Yuleba Surat Road, Yuleba (described as Lot 2 on SP197617). The site contains an existing approval for extracting and screening activities up to 100,000t of ore material (coarse sand and aggregate) per annum, and is seeking to expand up to 1,000,000t per annum. The product is intended for civil construction purposes. 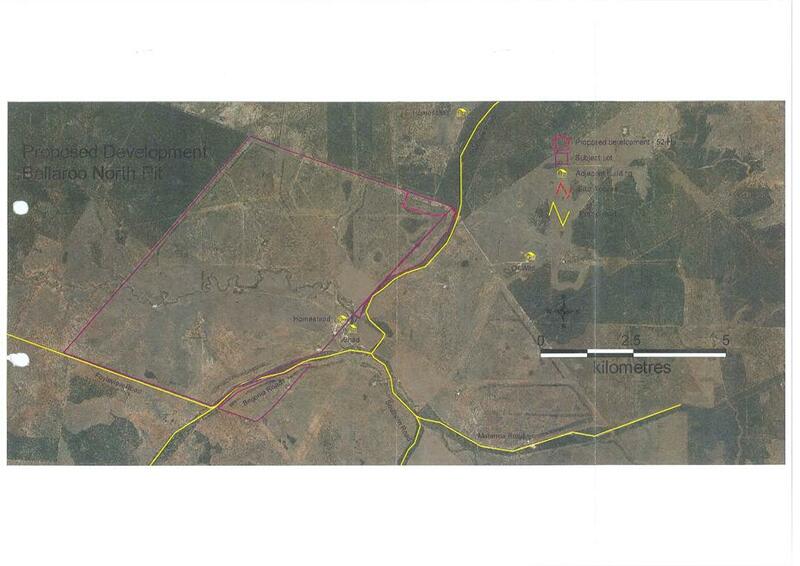 The work area is approximately 20ha, within a 492ha lot. No blasting is required. The hours of operation are between 6:00am to 6:00pm, 6 days a week. The operation requires 12-15 production staff rostered into two crews, plus 2 maintenance technicians and 3-4 administration staff. The site gains access onto Yuleba Surat Road, via a sealed intersection, extending 300m to the front gate. The site has an internal road, a section of which is sealed. The development requires the use of both light vehicles and heavy commercial vehicles, with an anticipated 12 trips/day and 162 trips/day respectively. The haulage route is predominantly north along Yuleba Surat Road, turning onto Bedwell Street, and then onto the Warrego Highway. The operation includes existing buildings and structures throughout the site, including amenities, and connections to existing services. The proposed expansion does not include any new buildings or structures, and simply seeks to expand the yearly output. The site contains a watercourse (Four Mile Creek), and is mapped as containing remnant vegetation (“Of Least Concern”). The nearest house is situated within the adjoining lot to the north-west (Lot 1 on SP197617). 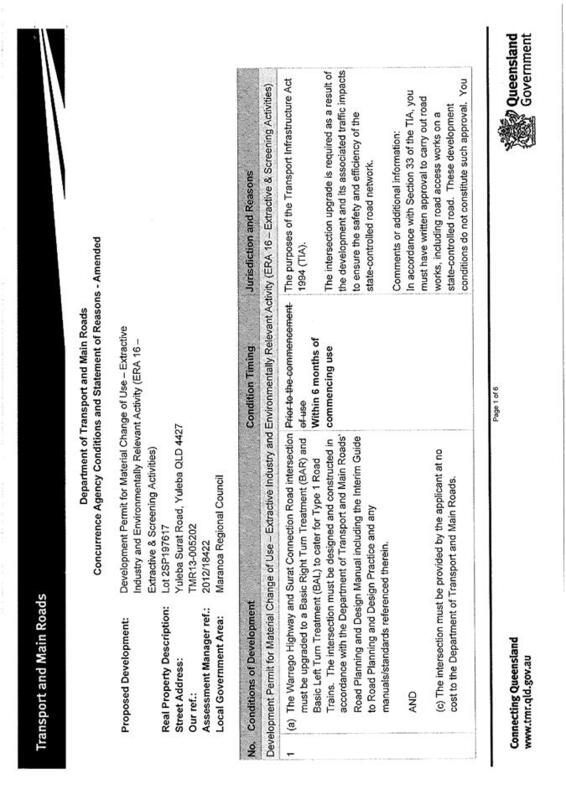 The development application material submitted to Council included an Environment Management & Operations Plan, dated November 2012. 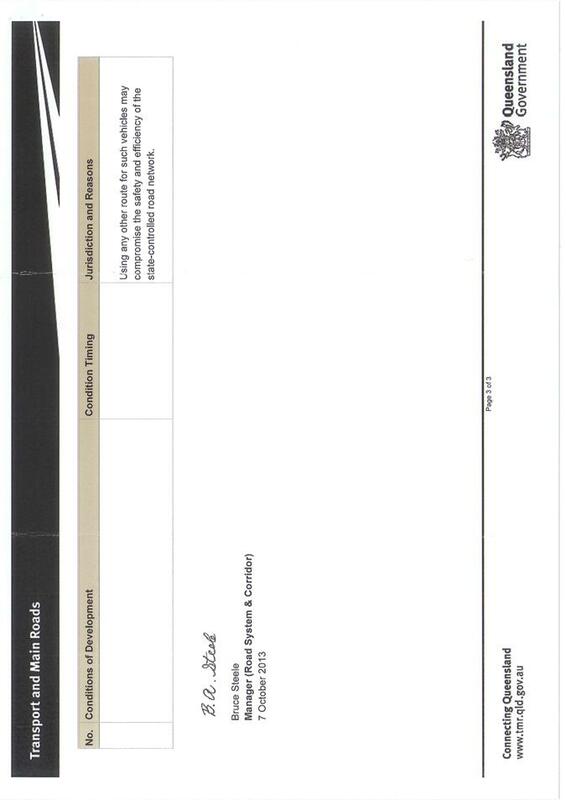 Refer to Attachment 2 for the proposal plans. 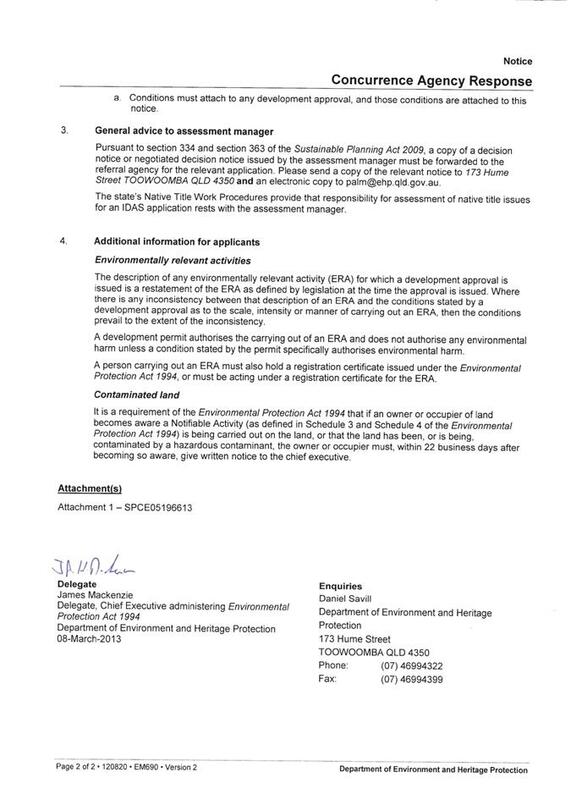 The Department of Environment & Heritage Protection assessed the application in relation to environmental impacts (ERA component) and issued concurrence conditions of development, dated 8 March 2013 (refer to Attachment 3). 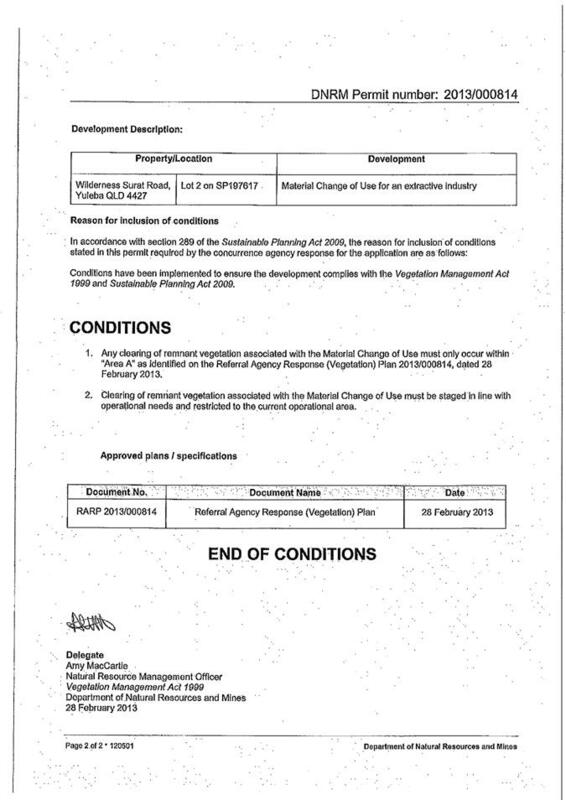 The Department Natural Resources & Mines assessed the application in relation to vegetation clearing and also issued concurrence conditions of development, dated 28 February 2013 (refer to Attachment 4). 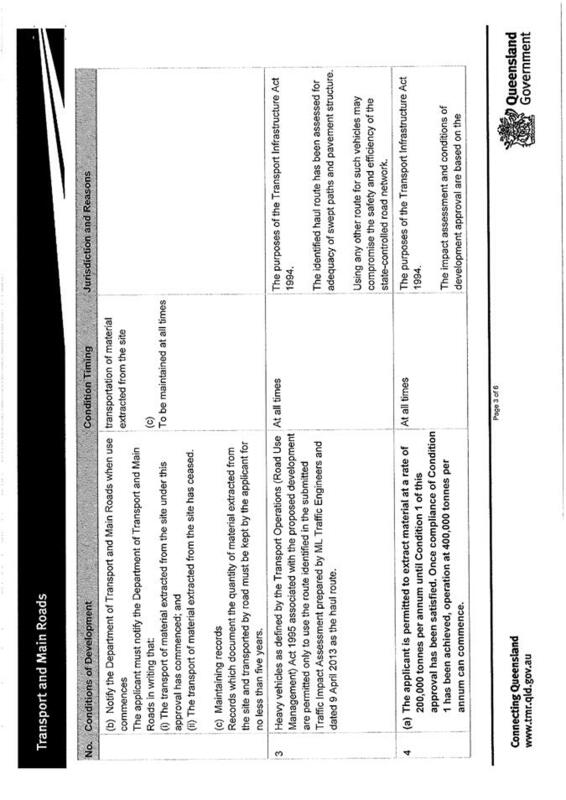 The Department of Transport & Main Roads have assessed the application in relation to impacts of road infrastructure and have issued concurrence conditions, dated 23 October 2013 (refer to Attachment 5). DTMR have conditioned that the Surat Connection Road and Warrego Highway intersection is to be upgraded. 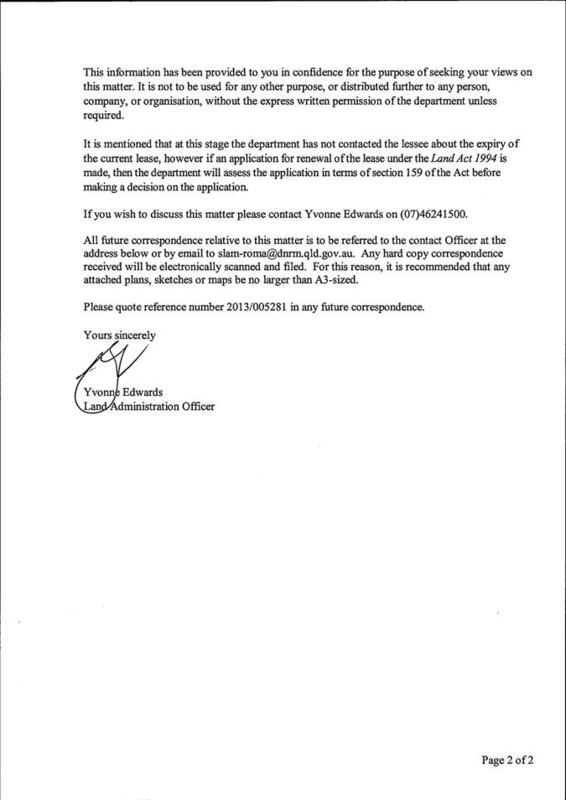 The development application was publically notified between 14 May 2013 to 12 June 2013, and no submissions were received. We note that the application was notified for a period of 21 business days (excluding 10 June 2013 as a public holiday), however due to there being three concurrence agencies, the application required 30 days of public notification under the Sustainable Planning Act 2009 (SPA). 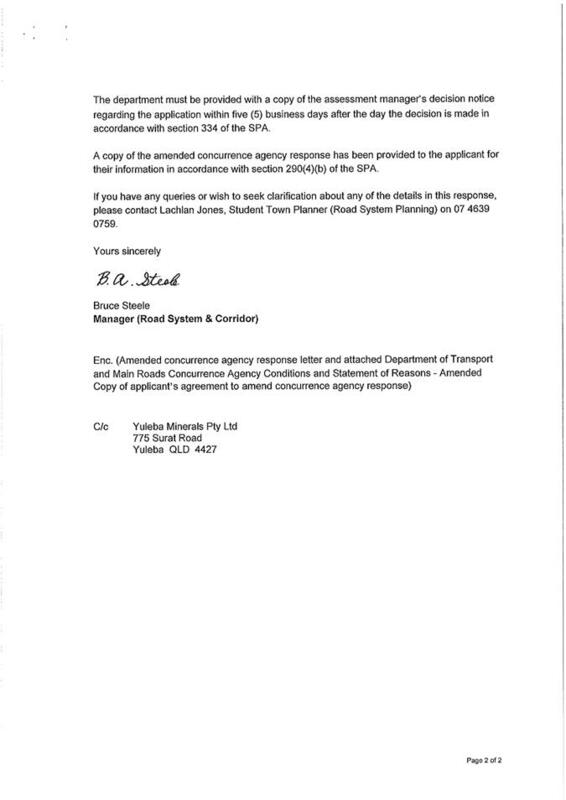 It is considered that the public notification period was sufficient in this instance, given that there were no public submissions, and that since the date the application was lodged, SPA 2009 has been amended to negate the 30 day notification period triggered by the number of concurrence agencies. 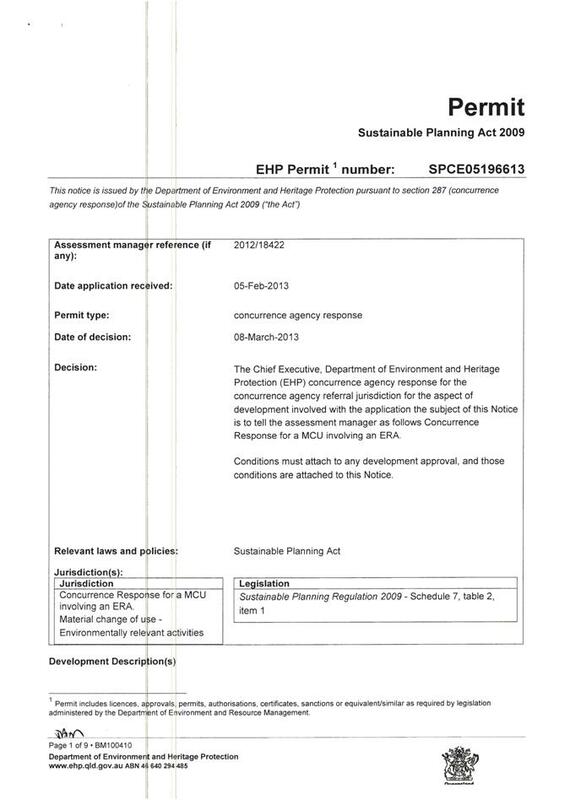 The application is subject to Impact Assessment and assessed against the relevant provisions of the planning scheme. Public Notification was carried out from 14 May 2013 to 12 June 2013. No submissions were received during this period. The subject site is mapped as containing remnant vegetation (“Of Least Concern”), protected areas and medium bushfire hazard. Matters relating to bushfire management and mitigating environmental impacts can be appropriately controlled by way of conditions of development. The Department of Environment & Heritage Protection assessed the application in relation to environmental impacts and the Department Natural Resources & Mines assessed the application in relation to vegetation clearing, and both issued conditions of development. Matters relating to land degradation can be appropriately addressed by way of the mitigation measures detailed in the Environment Management & Operations Plan and by way of conditions of development. Matters relating to ecological sustainability can be appropriately addressed by way of the mitigation measures detailed in the Environment Management & Operations Plan and by way of conditions of development. The subject site is not identified as being located in close proximity to, or a place of, historical, cultural or social significance. 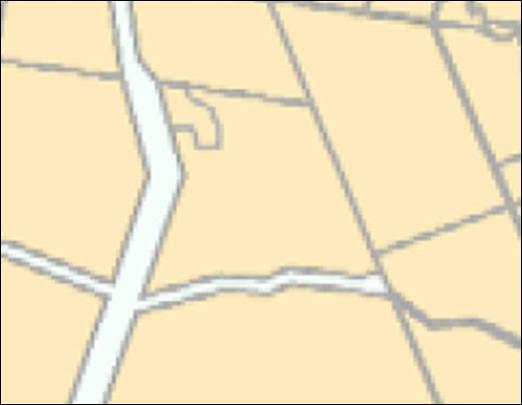 Part of the subject site (northern section) is mapped as GQAL. Extractive industry is by nature, commonly found within rural areas. The work area covers a relatively small portion of the site (20ha, of a 492ha lot) and does not significantly prejudice the balance areas to be utilised for agricultural purposes. 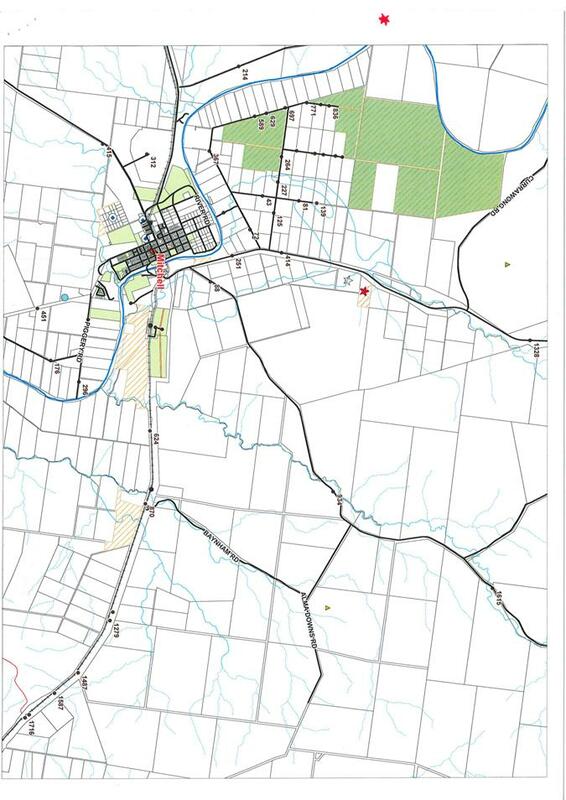 The proposed development has existing vehicle access via a crossover onto Yuleba Surat Road, and has existing connections to the relevant services. Matters relating to the provision or upgrading of any infrastructure components can be appropriately addressed by way of conditions of development. The proposed development is for an Industrial use and will not adversely impact on the role or identity of the Yuleba and Wallumbilla townships as the main centres for business within the shire. The Department of Transport & Main Roads have assessed the application in relation to impacts of road infrastructure and have issued conditions of development. 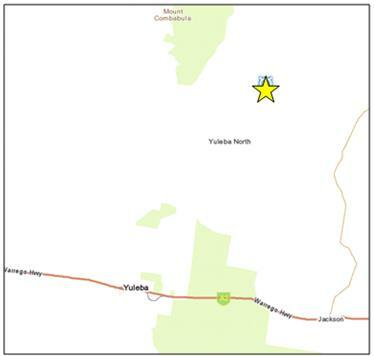 The subject site is mapped as containing medium bushfire hazard areas. Matters relating to bushfire management can be appropriately controlled by way of the mitigation measures detailed in the Environment Management & Operations Plan, and by way of conditions of development. The existing and proposed development covers a relatively small portion of a rural lot (20ha of 492ha lot) and does not prejudice the balance area and adjoining lots to be utilized for agricultural purposes. Matters relating to environmental impacts can be appropriately addressed by way of the mitigation measures detailed in the Environment Management & Operations Plan and by way of conditions of development. Matters relating to protecting local amenity can be appropriately addressed by way of the mitigation measures detailed in the Environment Management & Operations Plan and by way of conditions of development. 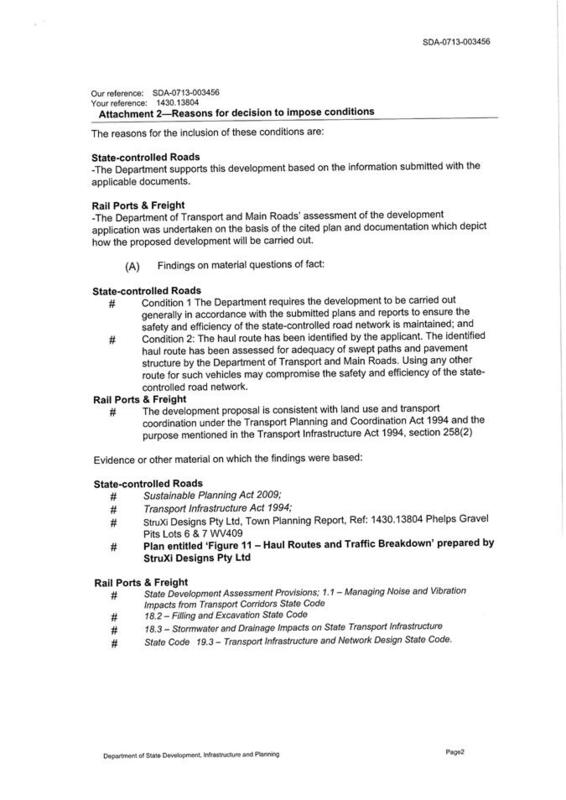 Matters relating to upgrading (if required) the existing access point on Yuleba Surat Road can be appropriately addressed by way of conditions of development. The Department of Transport & Main Roads have assessed the application in relation to impacts on road infrastructure and have issued conditions of development. 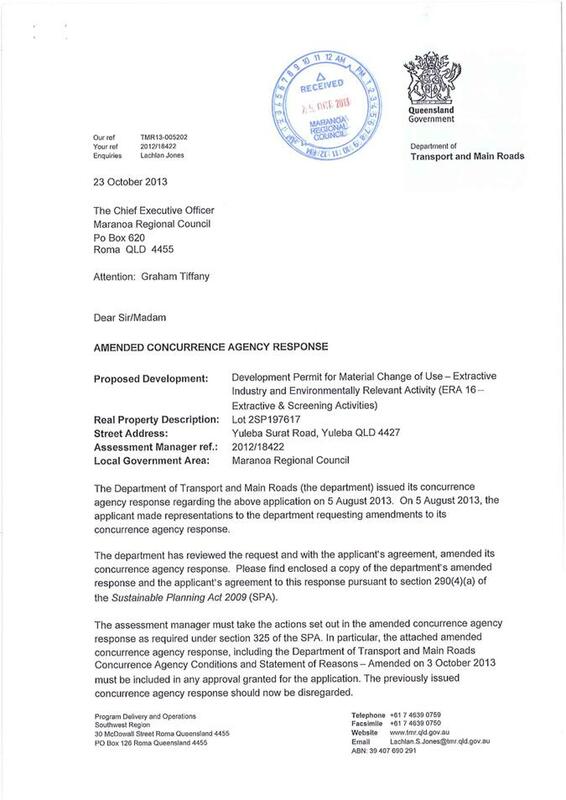 DTMR have conditioned that the Surat Connection Road and Warrego Highway intersection is to be upgraded. The subject site is mapped as containing remnant vegetation (“Of Least Concern”), protected areas and medium bushfire hazard. Matters relating to bushfire management and mitigating environmental impacts can be appropriately controlled by way conditions of development. The Department of Environment & Heritage Protection assessed the application in relation to environmental impacts, and the Department Natural Resources & Mines assessed the application in relation to vegetation clearing, and both issued conditions of development. Matters relating to providing any services can be appropriately addressed by way of the mitigation measures detailed in the Environment Management & Operations Plan and by way of conditions of development. Matters relating to protection of infrastructure can be appropriately addressed by way of the mitigation measures detailed in the Environment Management & Operations Plan and by way of conditions of development. Matters relating to electricity supply can be appropriately addressed in the conditions of development. The development includes a series of collection dams. Matters relating to stormwater collection and drainage can be appropriately addressed by way of the mitigation measures detailed in the Environment Management & Operations Plan and by way of conditions of development. 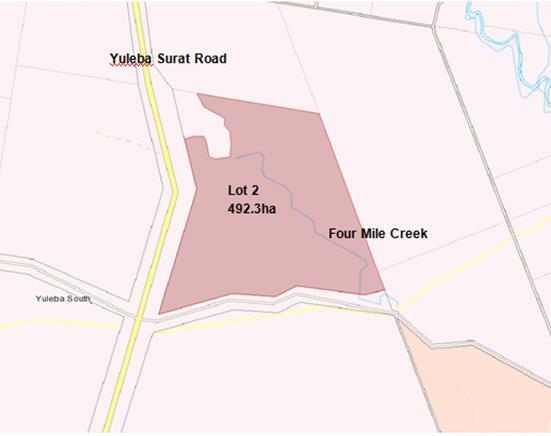 The proposed development includes an existing vehicle access point onto Yuleba Surat Road (western boundary of the site), and an internal driveway. Matters relating to upgrading (if required) the existing access point and internal driveway can be appropriately addressed by way of conditions of development. Given that the development is located within a large lot, it is considered that there is sufficient area for parking, without a need for delineated spaces. The proposed development includes an existing vehicle access point onto Yuleba Surat Road, and an internal driveway (part of which is sealed). Although the proposal does not include any new roads, the development represents a burden on the local road network. 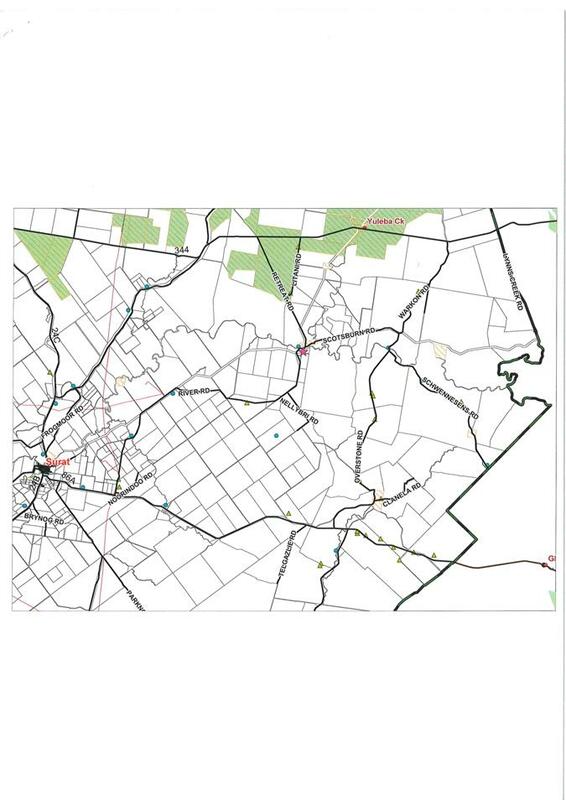 Specifically, it has been identified the connection road between Yuleba Surat Road and the Warrego Highway needs to be upgraded to sustain the proposed haulage route. The development will be conditioned accordingly. Matters relating to upgrading the existing access point, internal driveway and local road, can be appropriately addressed by way of conditions of development. The Department of Transport & Main Roads have assessed the application in relation to impacts on road infrastructure and have issued conditions of development. DTMR have conditioned that the Surat Connection Road and Warrego Highway intersection is to be upgraded. The subject site is not located in close proximity to gas and oil pipelines. The subject site contains a watercourse (Four Mile Creek). The proposed development provides for a buffer area from the creek (a minimum of 50m). Matters relating to flood mitigation can be appropriately addressed by way of the mitigation measures detailed in the Environment Management & Operations Plan and by way of conditions of development. Matters relating to air emissions can be appropriately addressed by way of the mitigation measures detailed in the Environment Management & Operations Plan and by way of conditions of development. 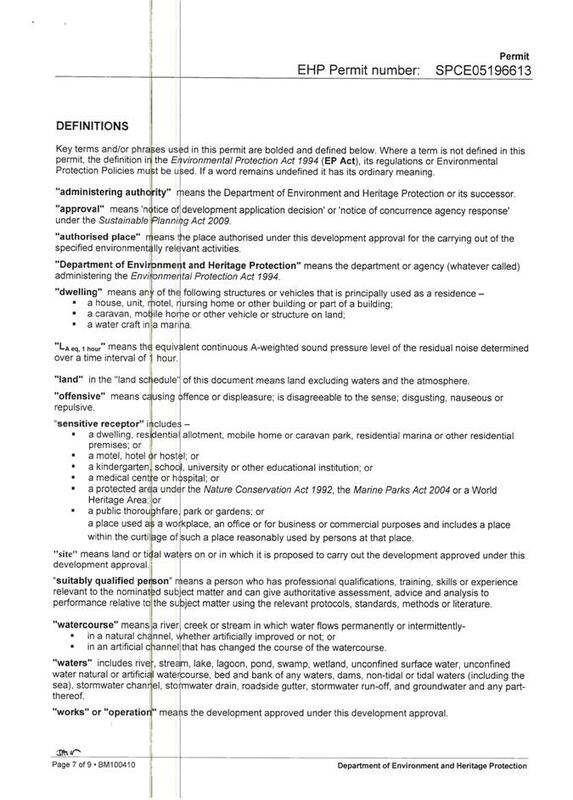 The Department of Environment & Heritage Protection assessed the application in relation to environmental impacts and issued conditions of development. Matters relating to noise emissions can be appropriately addressed by way of the mitigation measures detailed in the Environment Management & Operations Plan and by way of conditions of development. Matters relating to maintaining water quality can be appropriately addressed by way of the mitigation measures detailed in the Environment Management & Operations Plan and by way of conditions of development. The subject site is mapped as containing remnant vegetation (“Of Least Concern”). Matters relating to environmental impacts can be appropriately controlled by way of the mitigation measures detailed in the Environment Management & Operations Plan, and by way of conditions of development. The Department Natural Resources & Mines assessed the application in relation to vegetation clearing and also issues conditions of development. The subject site is mapped as containing protected areas. The Department Natural Resources & Mines assessed the application in relation to vegetation clearing and also issued conditions of development. The development is generally not situated on significantly sloping land. N/A – The development is not adjacent to buildings identified as heritage or character buildings. N/A – The site is not in close proximity to known areas of cultural heritage. 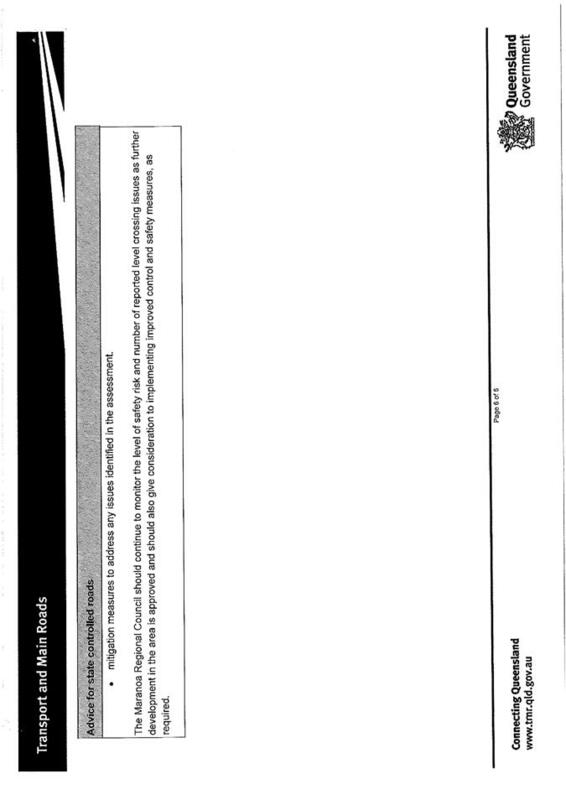 Public notification was carried out between 14/05/2013 and 12/06/2013, and no submissions were received. Although the planning scheme requires Impact Assessment for the proposed use, there is no conflict with the intent of the Bendemere Shire Planning Scheme. The development is appropriately located within the Rural area, and any matters relating to environmental impacts, protection of amenity and infrastructure upgrading can be appropriately addressed by way of conditions. To organise a meeting with Agents to discuss cattle numbers required for Store and Prime Sales. Getting Penny Arthur from Queensland Country Life to present to the Saleyards Advisory Committee. Confirm if a chilled water cooler plugged into the main up at the Load Out Hut area has been included within the budget. Inform WHS of issue, to be recorded into the Hazard Register. Change minimum number for a quorum from 7 to 4. A schedule will be developed of the 2014 meeting dates and given to each member at the last meeting of 2013 on the 28th November. Invite all Agents to the Christmas celebration to be held after the meeting on 28th November. Invite the new President and Delegate of the Agents Association to the meeting on the 28th November. The Advisory Board welcomed all members and guests and declared the meeting open at 1.00pm. 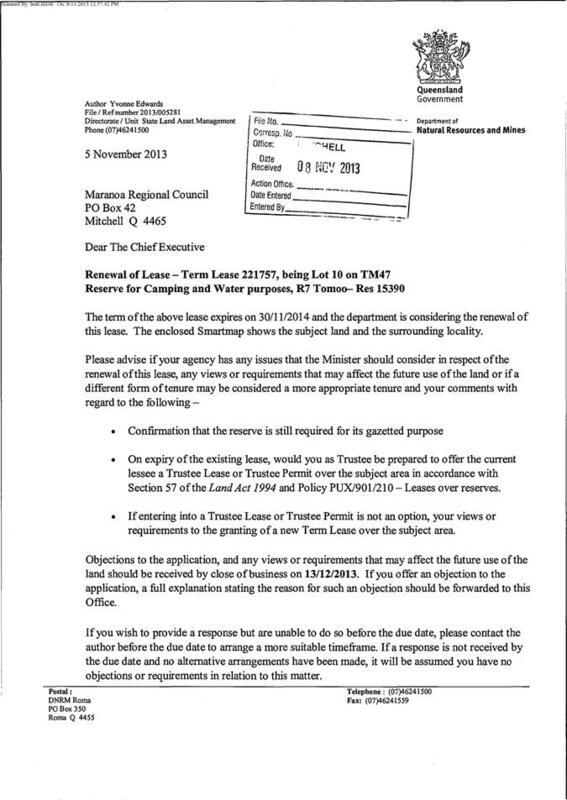 That the Roma Saleyards Advisory Committee Meeting minutes from the 11th September 2013 be confirmed. No business arising from the previous meeting on the 11th September 2013. Terry Hyland thanked the Agents for their hard work and dedication throughout the year and spoke in regards to the sales figures throughput. The total sales throughput from the 1/10/2013 to the 31/10/2013 is 31, 636 head compared to the same period for 2012 which was 29, 216 head. Terry Hyland informed the Committee in regards to yard cleaning, repainting of the chalking area on gates and numbers & resurfing areas. The last sale for the year will occur on the 17/12/2013 and the first sale for the 2014 is scheduled for the 14/01/2013 weather permitting. Terry Hyland informed the Committee of a recent incident involving one of the workers at Grumpy Yard obtaining a broken collar bone from a beast. Many workers and visitors to the Saleyards have noted that a chilled water cooler close to the load out hut would be favourable as it is a lengthy walk to the nearest water cooler. The Advisory Committee discussed the excellent record the Saleyards holds in regards to Workplace health & safety issues. That the Roma Saleyards Advisory Committee Meeting recommend a chilled water cooler to be plugged into the main up at the Load out Hut area. Terry Hyland informed the Committee that there has been very few drought affected cattle come through the Saleyards up until the end of September. Quite a few have come to the Saleyards in October; however these have generally been in strong condition. Gordon Johnston from Grumpy Yard addressed the Committee to suggest a meeting should occur with the Agents in regards to numbers of cattle for store and prime sales. Terry Hyland advised that a meeting will be organised and an outcome will be brought to the next meeting. The Saleyards will not be sponsoring the cricket on Imparja as the price was not seen as practical. The Saleyards will continue with the market reports and advertisements through to December. From January to May for little cost the market reports will run until a decision is made as to the advertising throughout the football season. Committee members agreed that this was the most beneficial and cost effective way of advertising. James Stinson addressed the Committee about the massive role social media has within society and how it can benefit the Saleyards. Social Media like Facebook and Twitter can help to keep up to date and get the Saleyards name and brand out into the eye of the public. The Committee discussed the talk given at the Australia Livestock Market Association Meeting about Social Media. It was said to be very helpful and Terry Hyland discussed the possibility of getting Penny Arthur from Queensland Country Life to present to the Saleyards Advisory Committee. The Saleyards has been completing the Agent’s office electronic check off. Agents from the Agents Association are willing to take over this process. Once they have finalised the applicants they will inform the Saleyards. James Stinson addressed the Committee about the option of providing bull selling at Basset’s Park. The bull selling facility at the Saleyards will require a rebuild within the future and the revenue from the bull sales would not generate enough income to cover the cost of the rebuild. The Committee discussed whether the idea was practical and convenient to hold bull sales at Basset’s Park. That James Stinson recommends to the Committee and Council for Bull Sales to be considered in the scope of the Basset Park Master Plan. The Committee members provided feedback in regards to items that require priority within the Master Plan. A draft terms of reference has been developed for the Committee members. A terms of reference provides the Committee members with a detailed purpose, objectives, structure and responsibilities of the Advisory Members. The terms of reference will require to be adopted by the Committee to take affect. That the minimum number for a quorum be changed from 7 to 4. Discussion was held between the members who came to an agreement that the Saleyards Advisory Committee meeting will occur on the last Thursday of each month at the Saleyards from 1.00pm. A schedule will be developed and given to each member at the last meeting of 2013. The last meeting for 2013 will be held on the 28th of November at the Roma Saleyards commencing at 3.00pm. Following the meeting will be a Christmas celebration to which all the Agents will be invited.